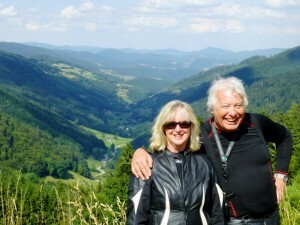 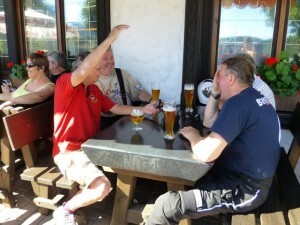 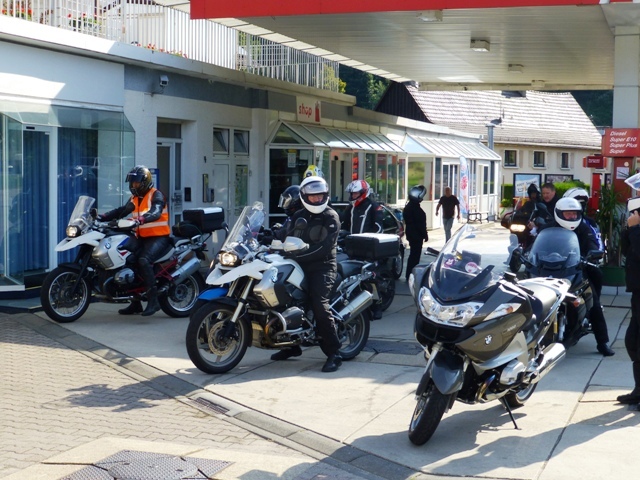 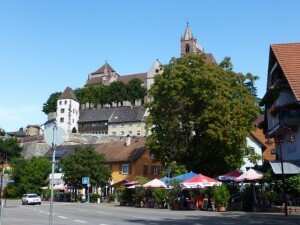 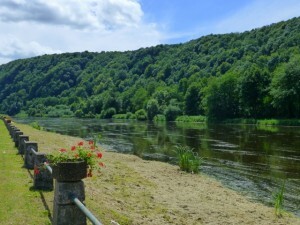 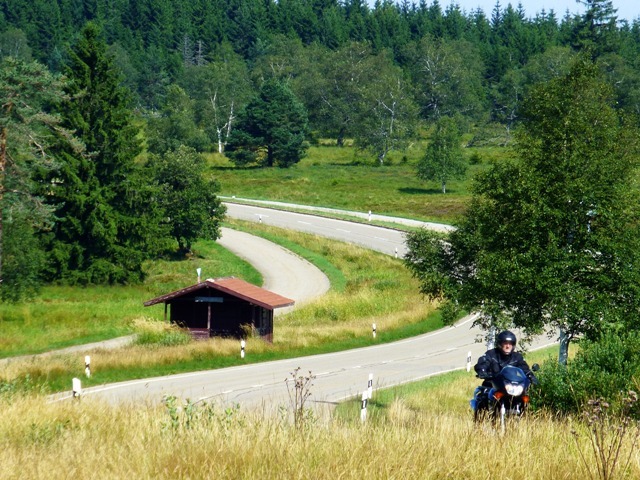 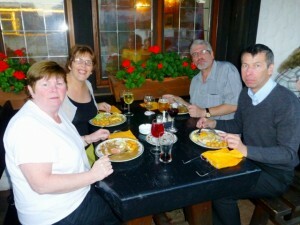 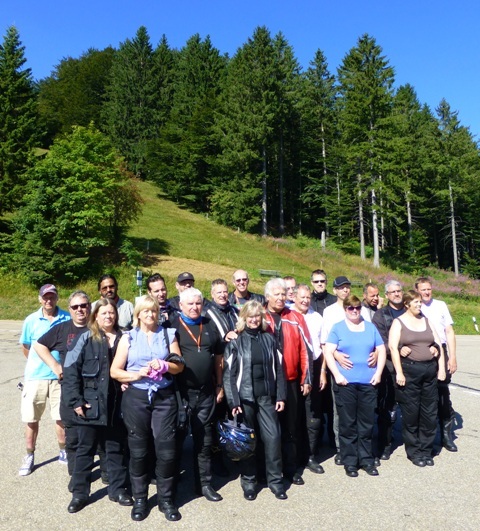 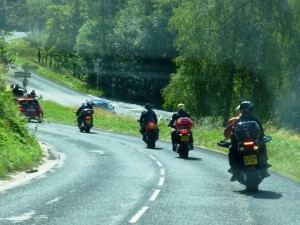 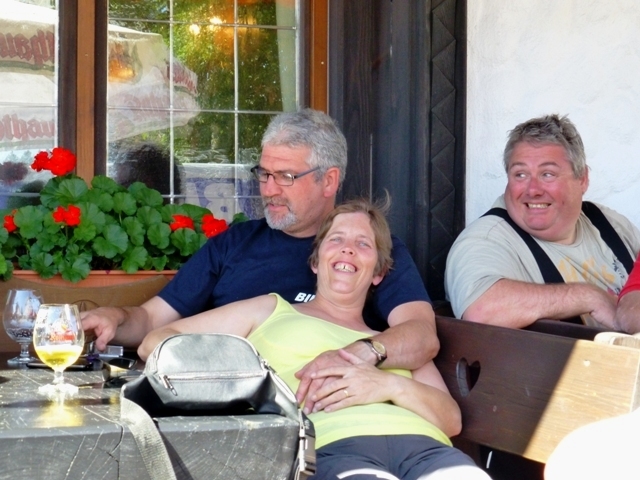 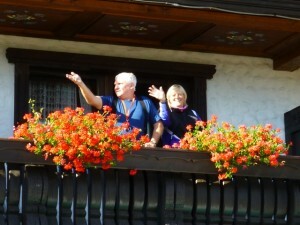 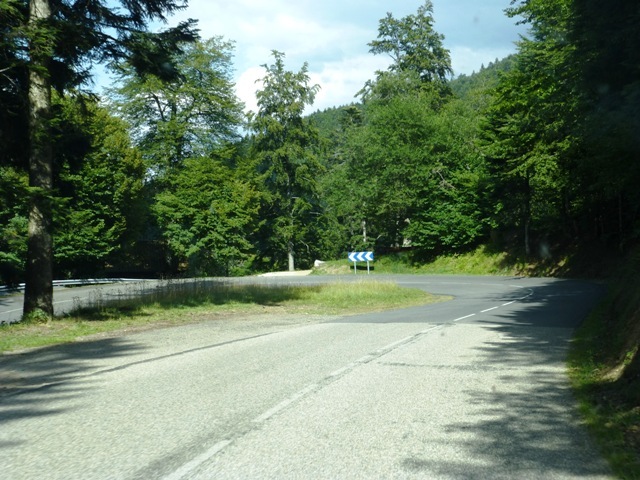 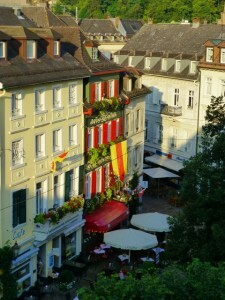 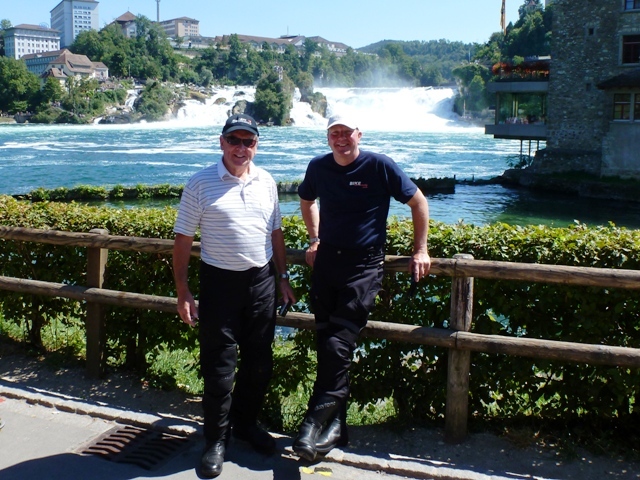 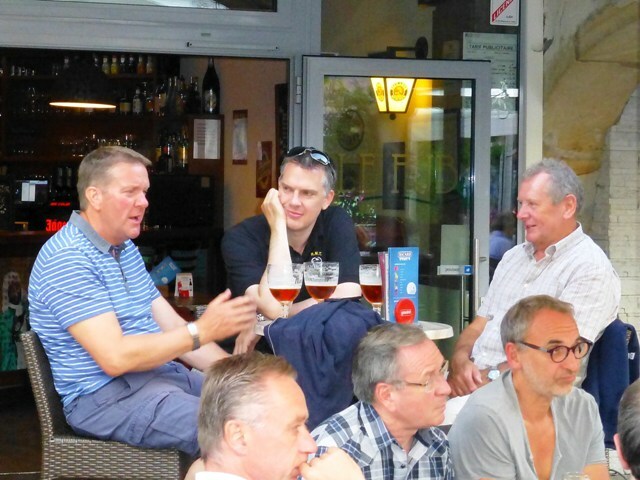 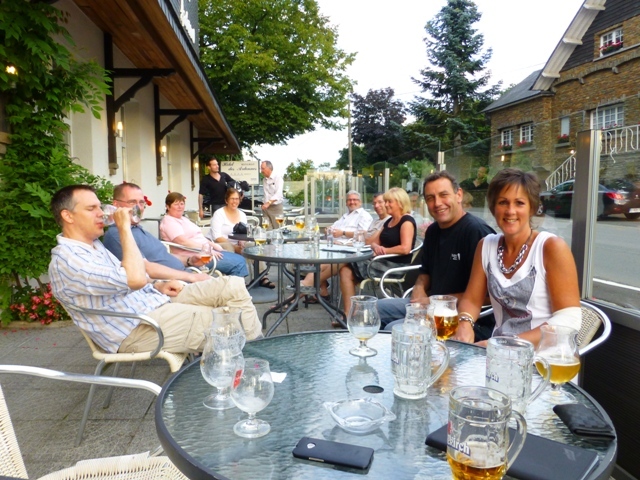 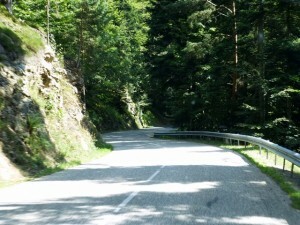 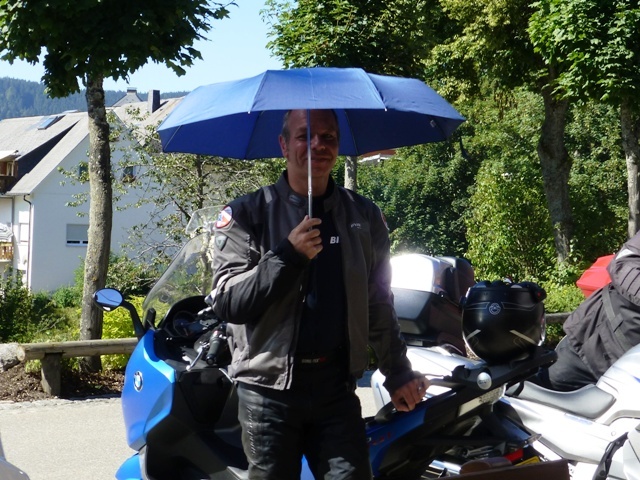 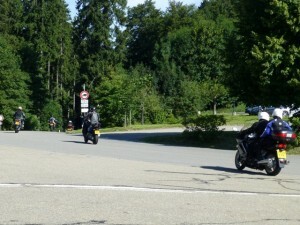 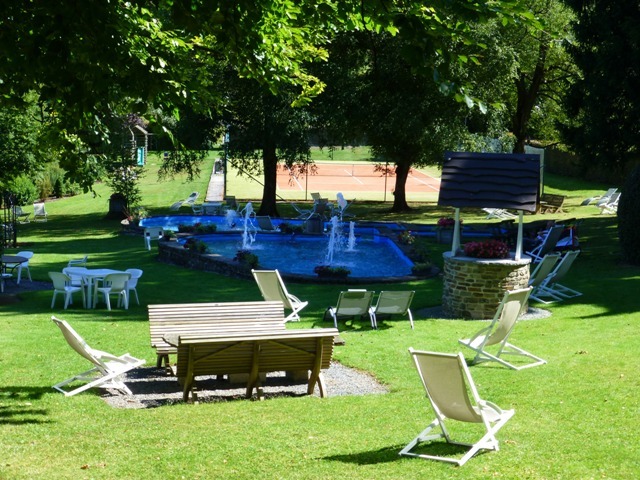 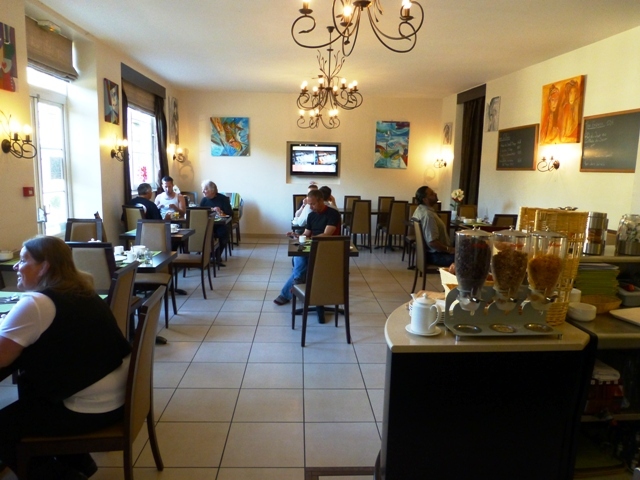 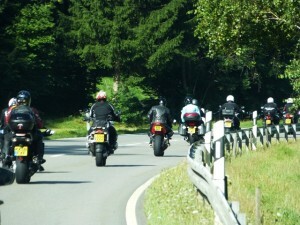 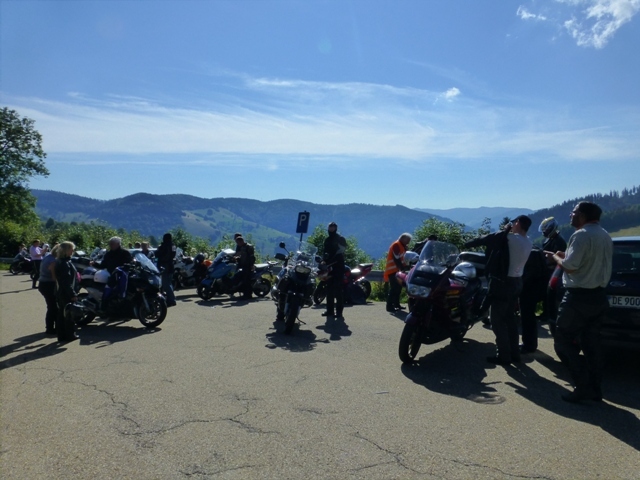 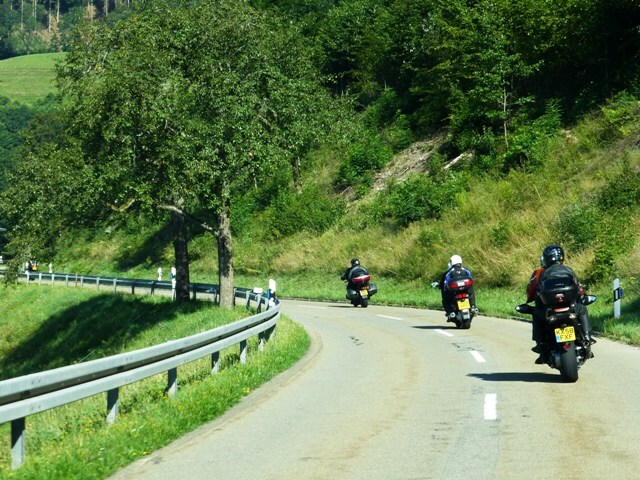 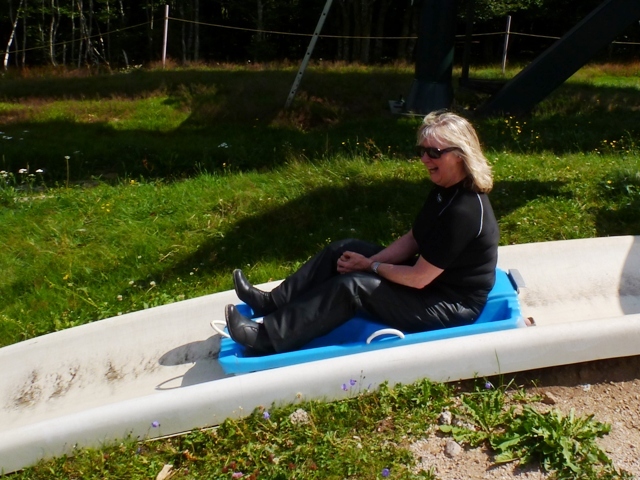 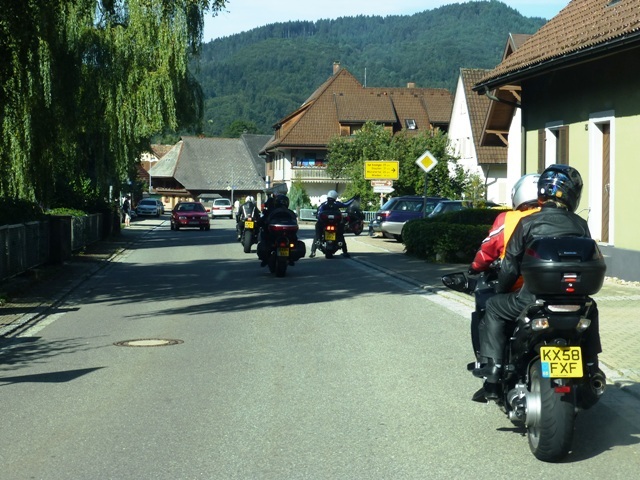 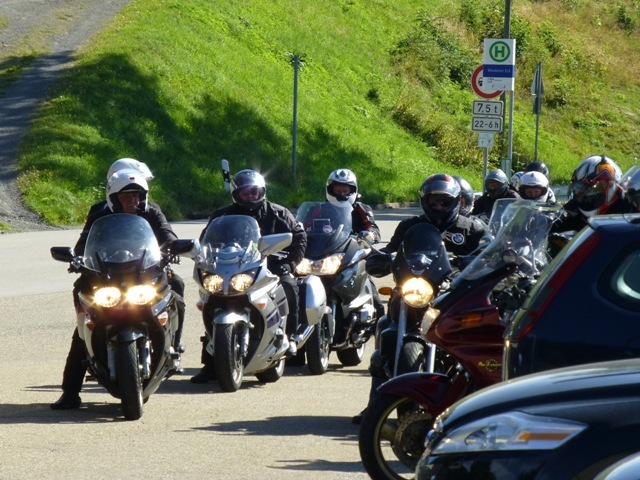 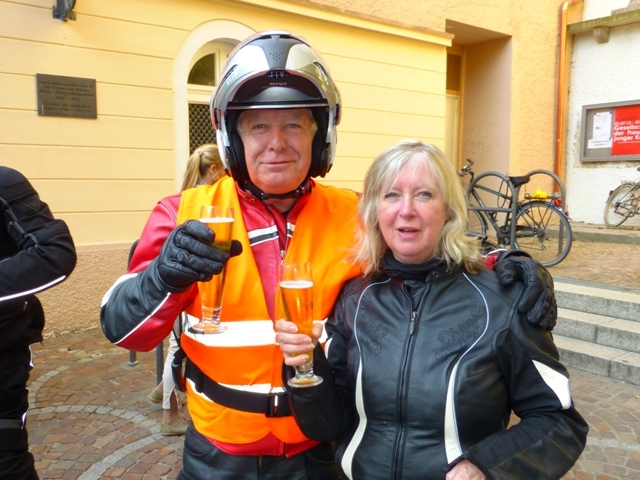 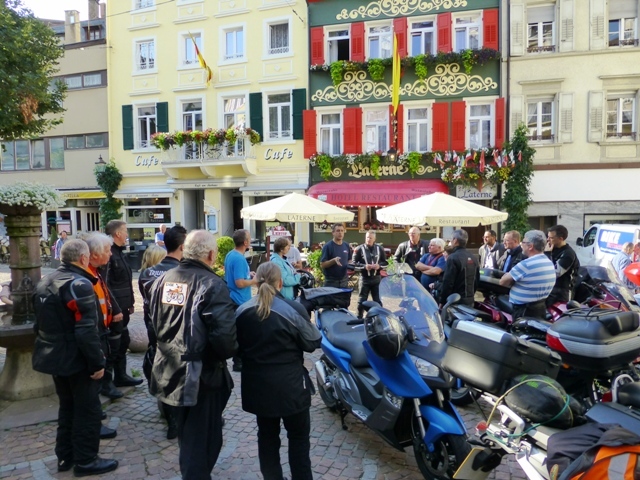 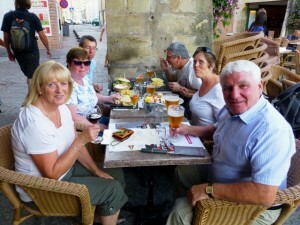 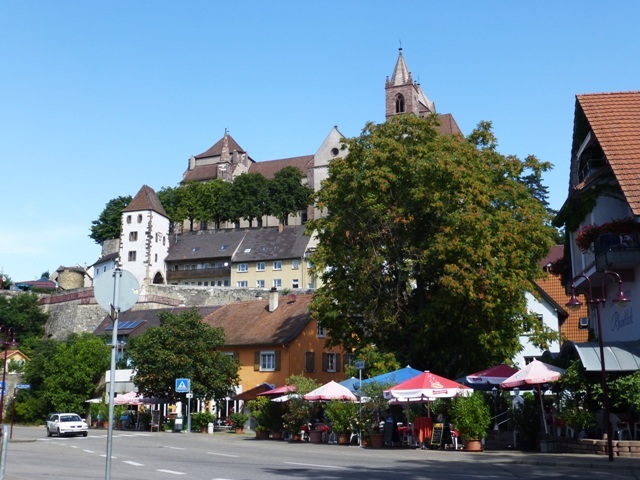 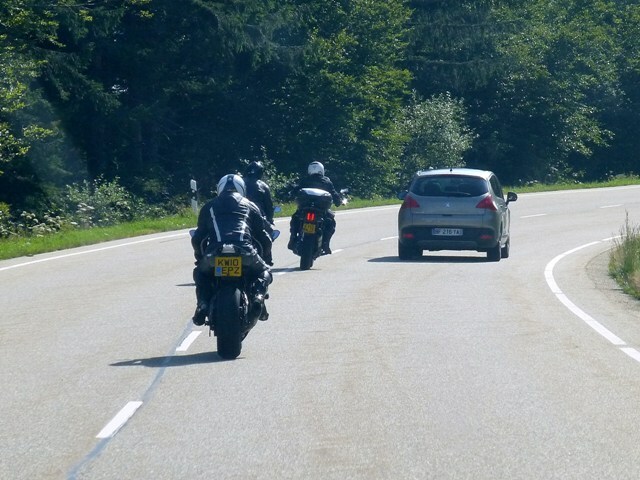 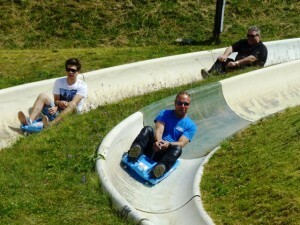 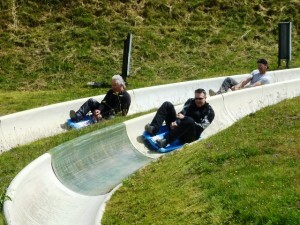 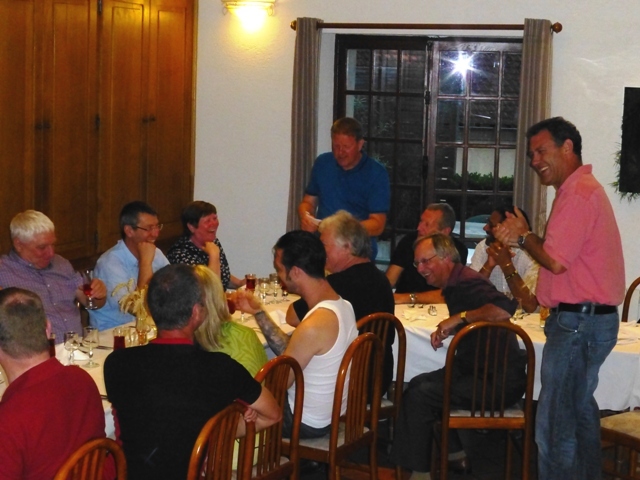 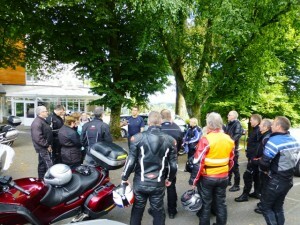 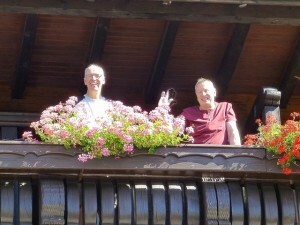 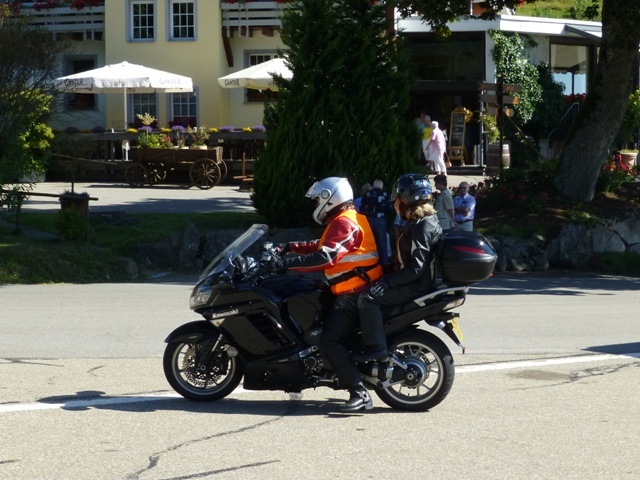 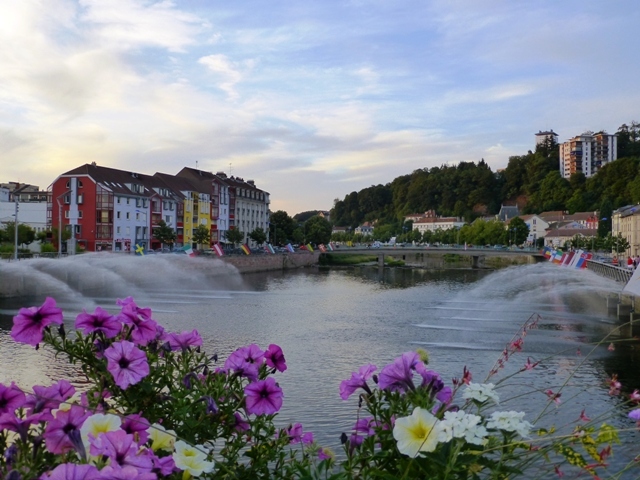 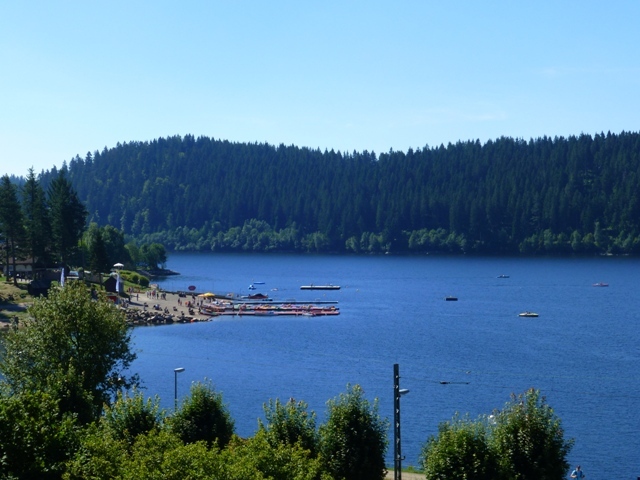 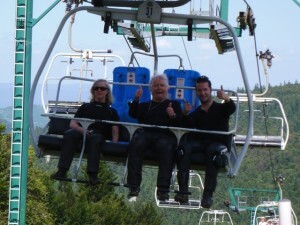 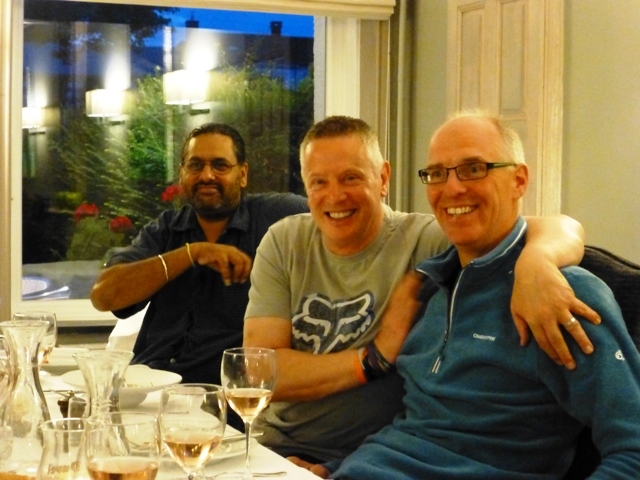 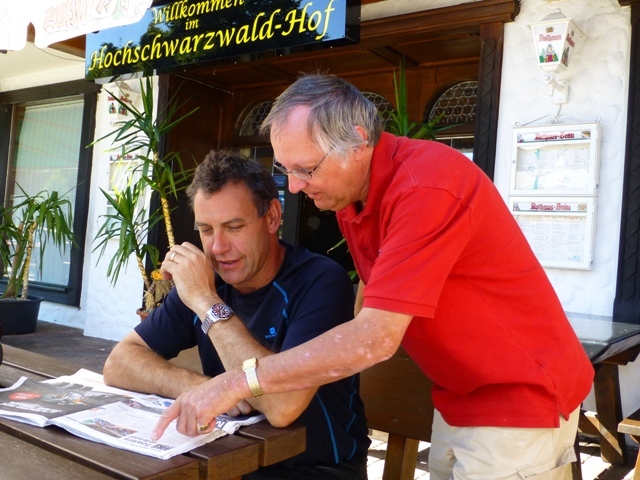 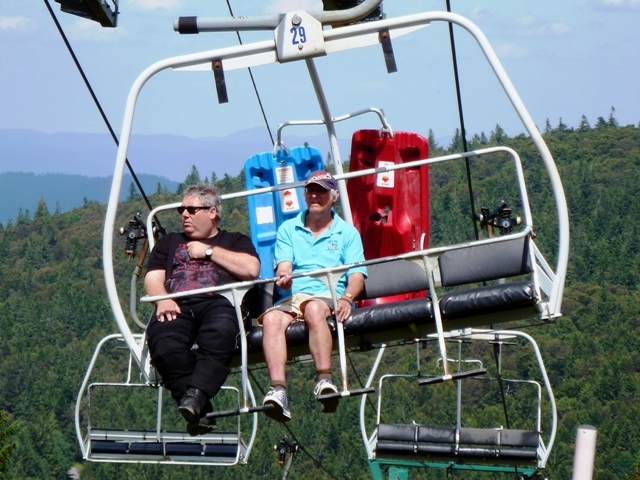 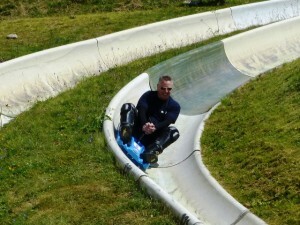 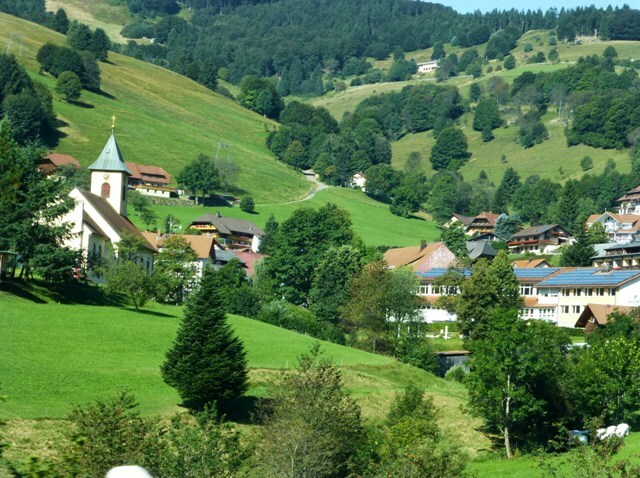 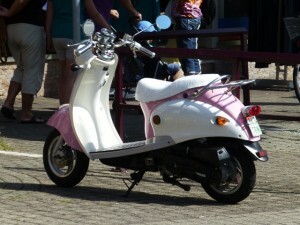 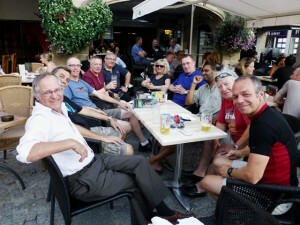 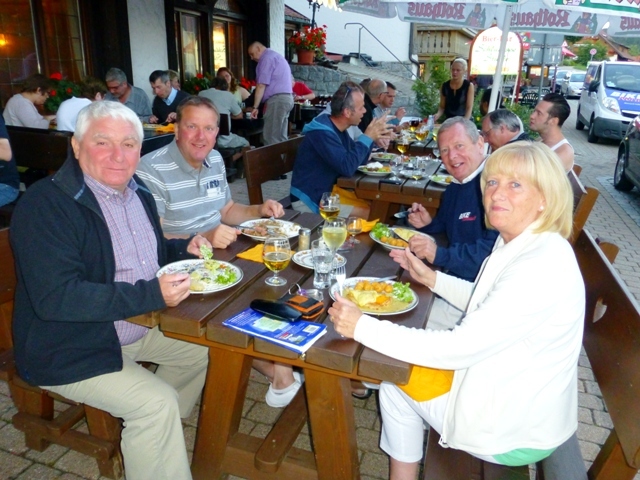 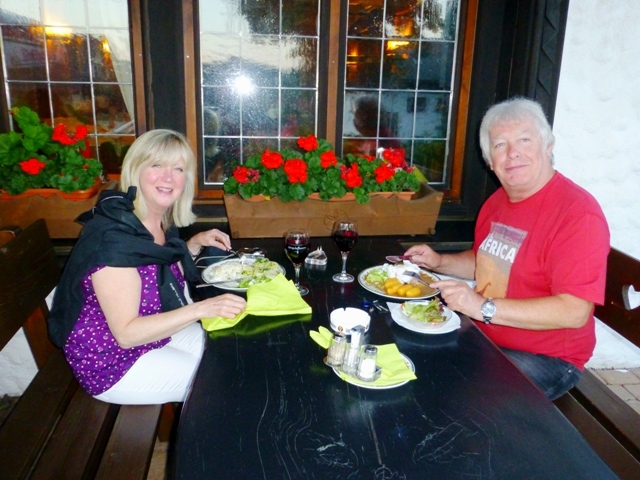 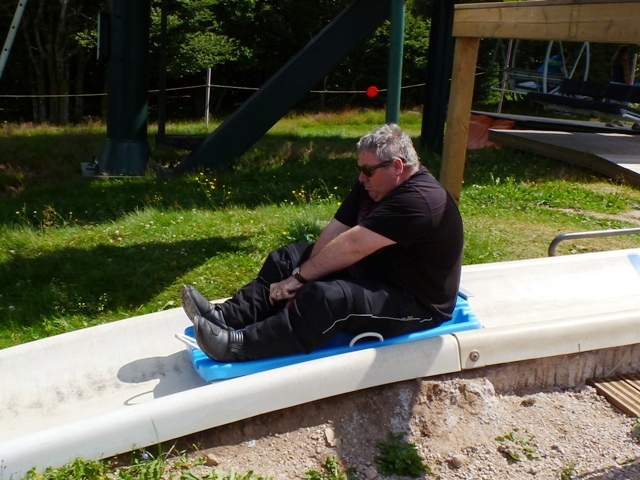 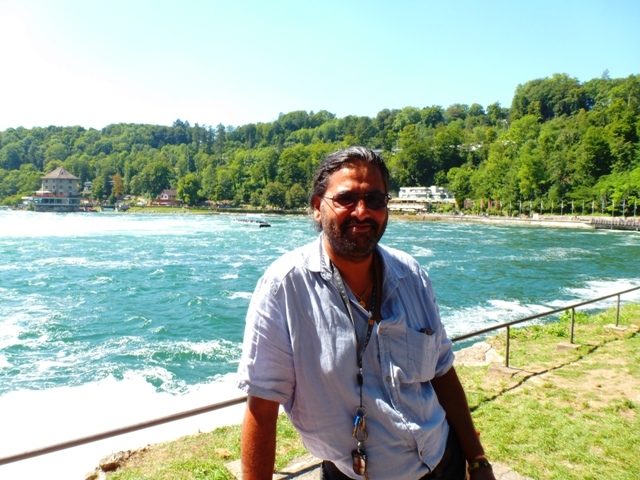 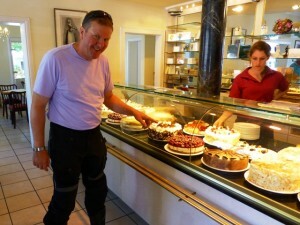 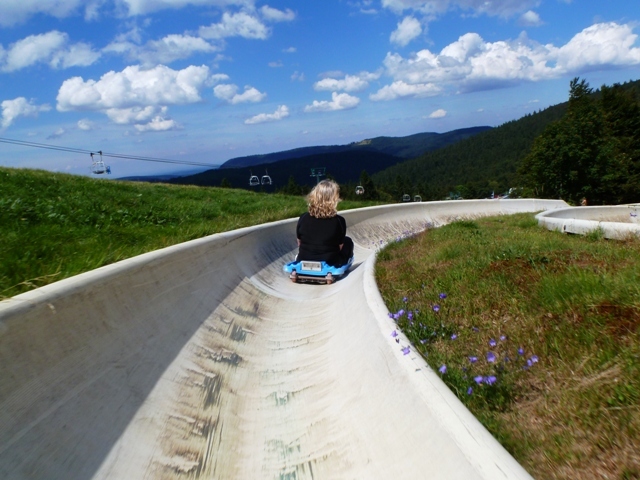 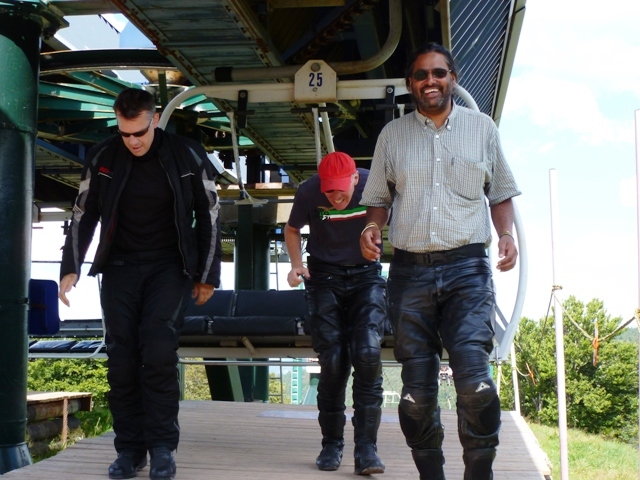 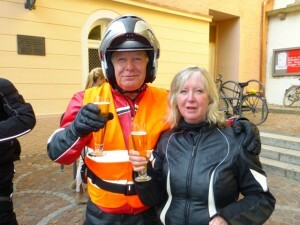 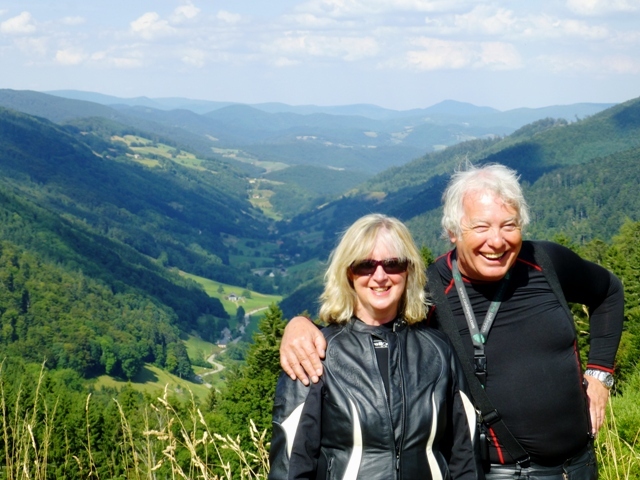 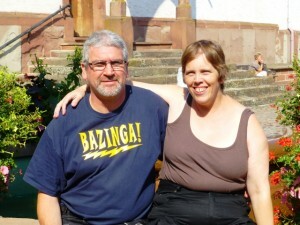 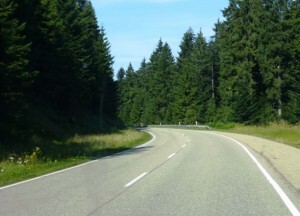 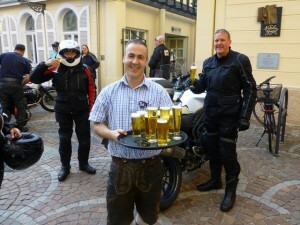 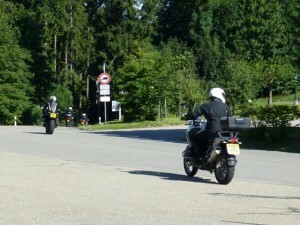 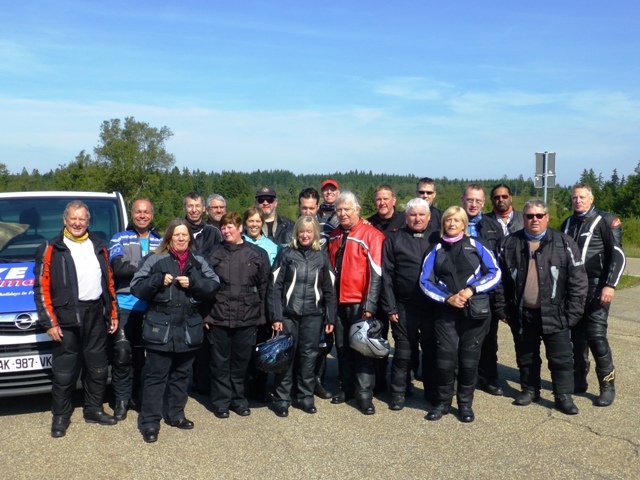 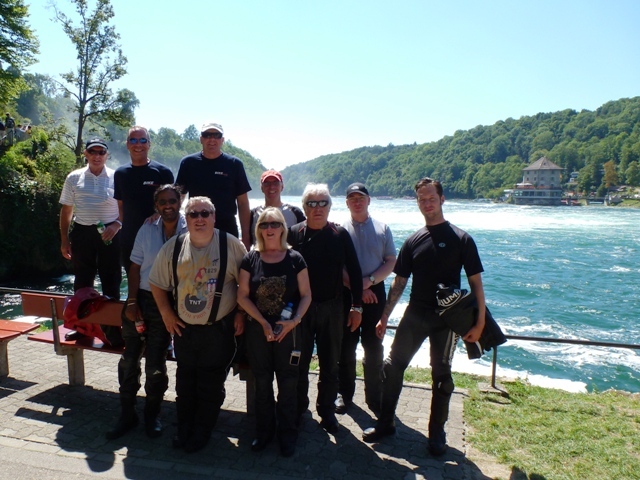 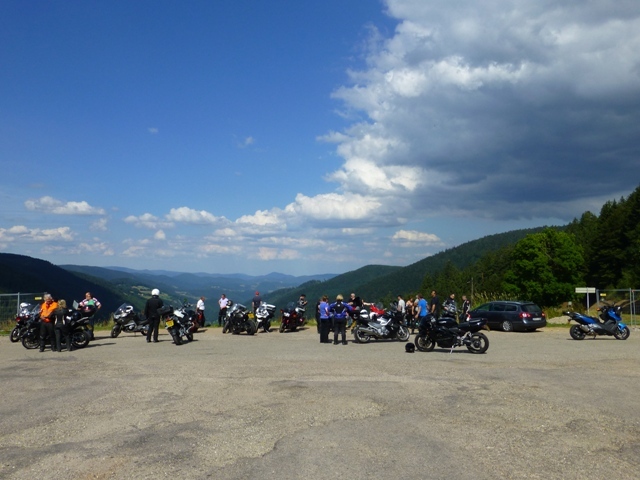 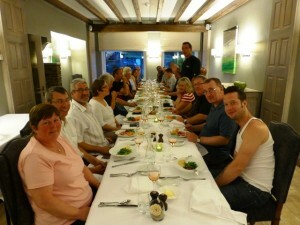 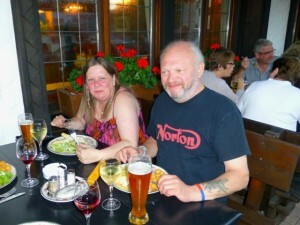 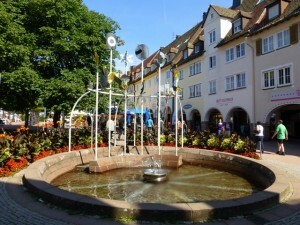 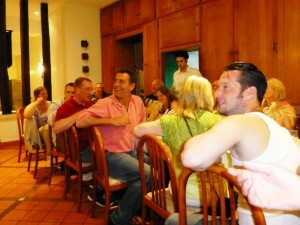 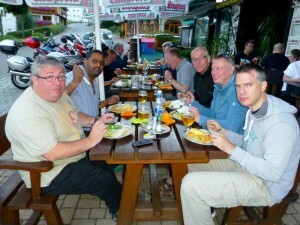 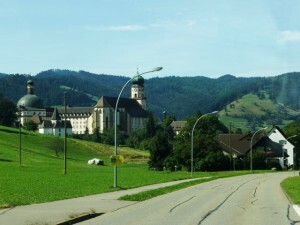 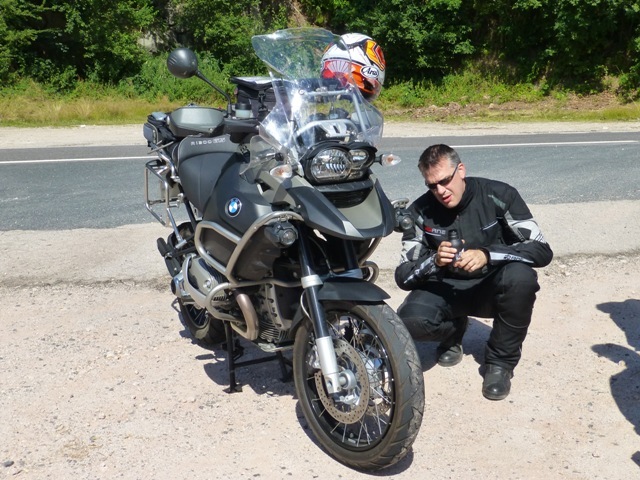 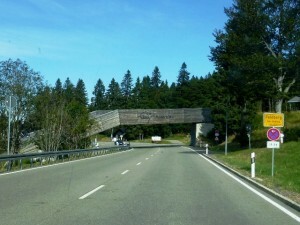 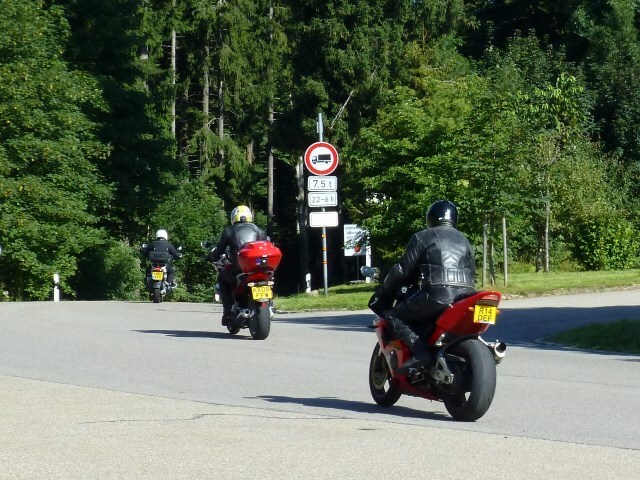 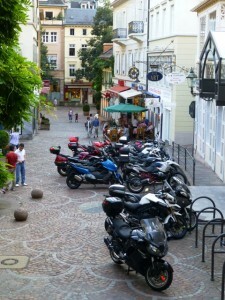 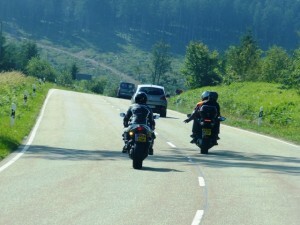 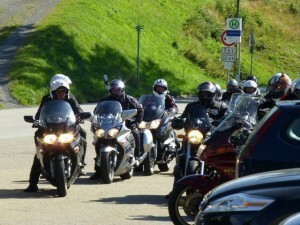 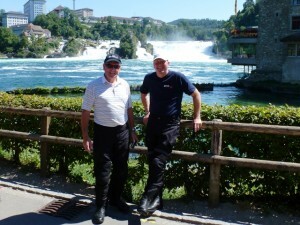 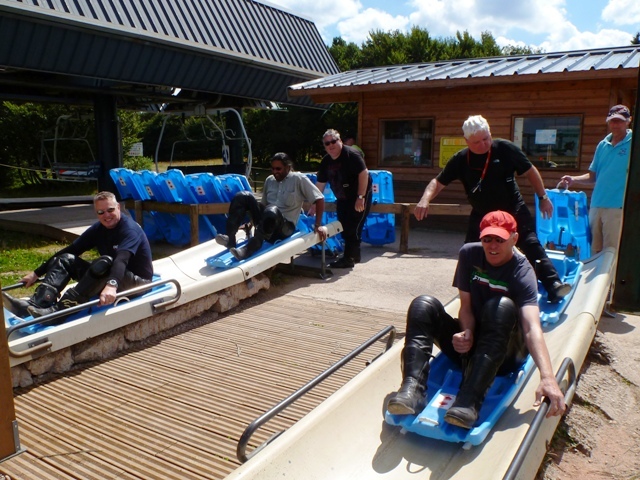 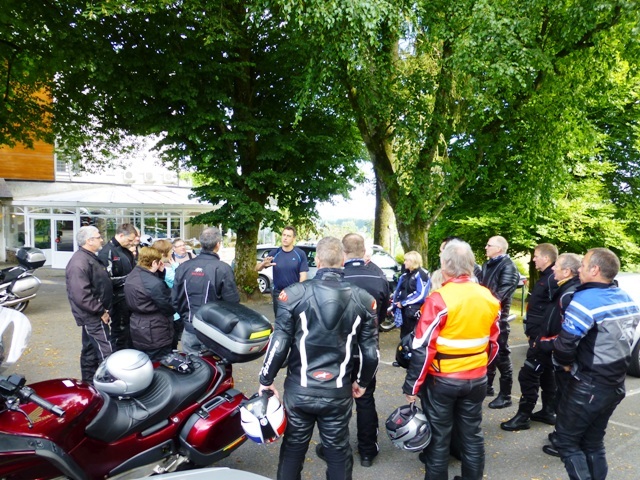 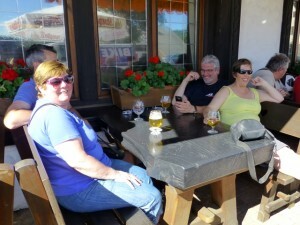 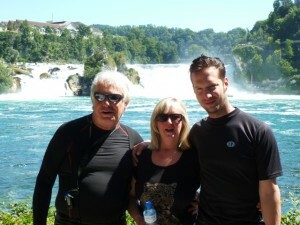 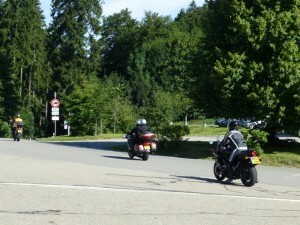 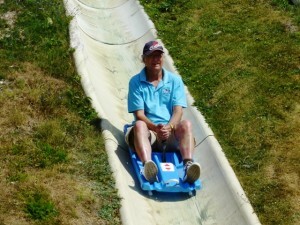 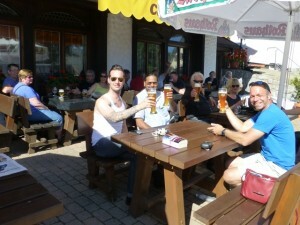 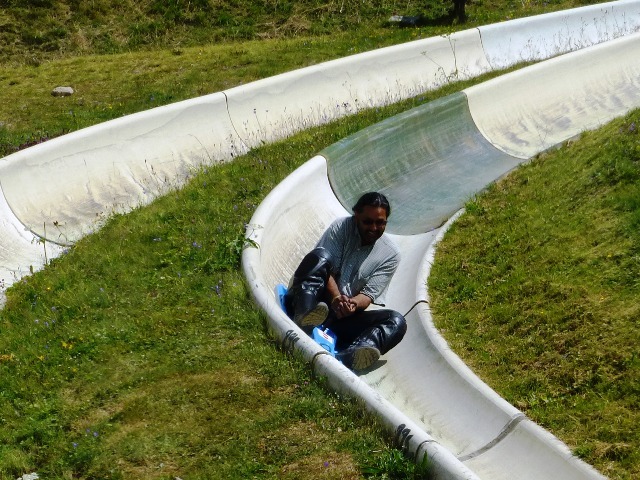 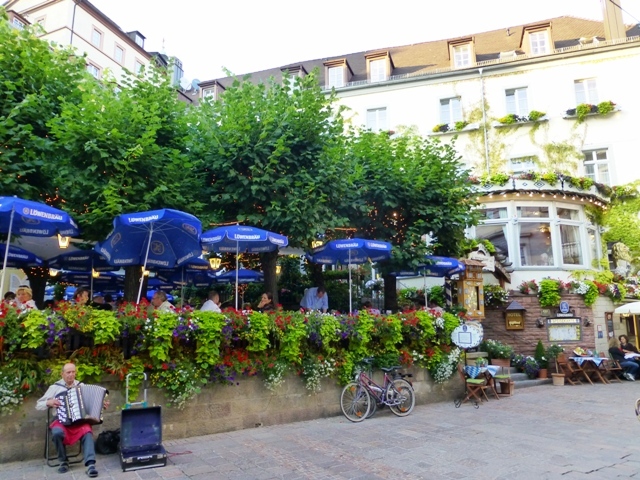 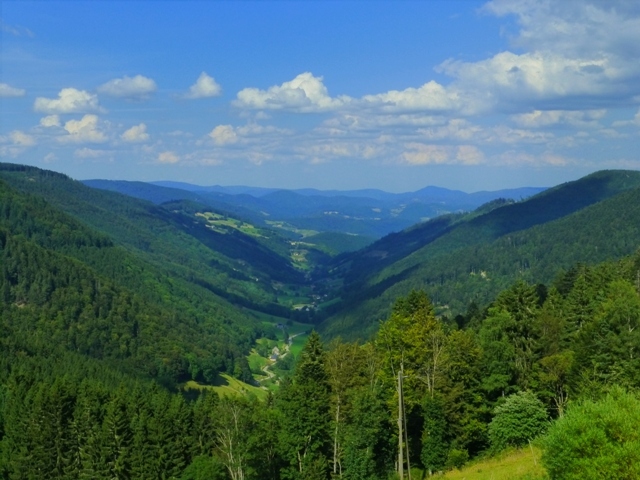 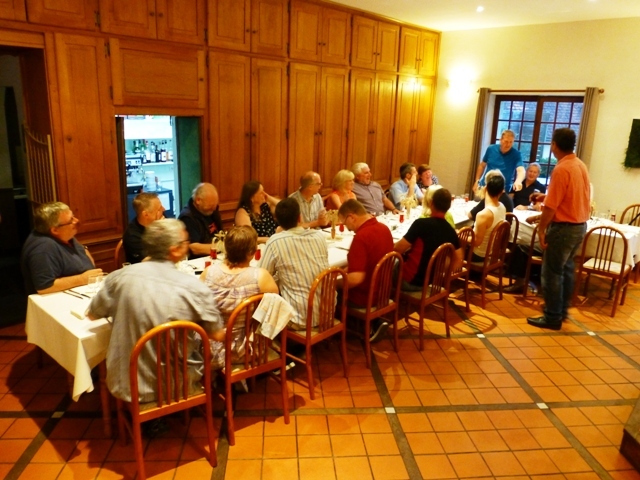 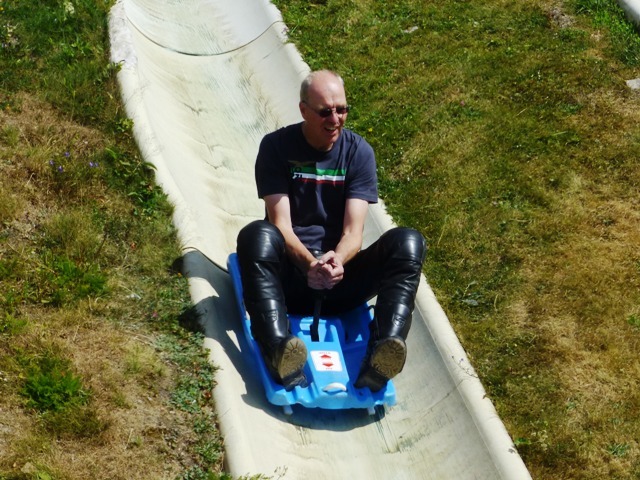 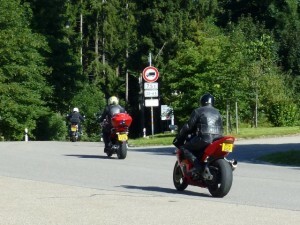 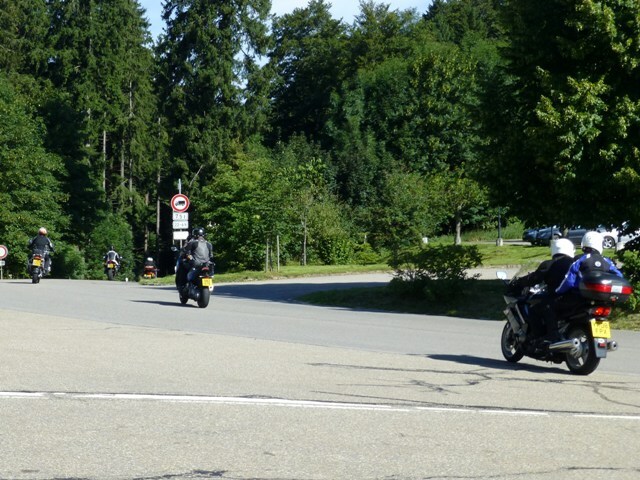 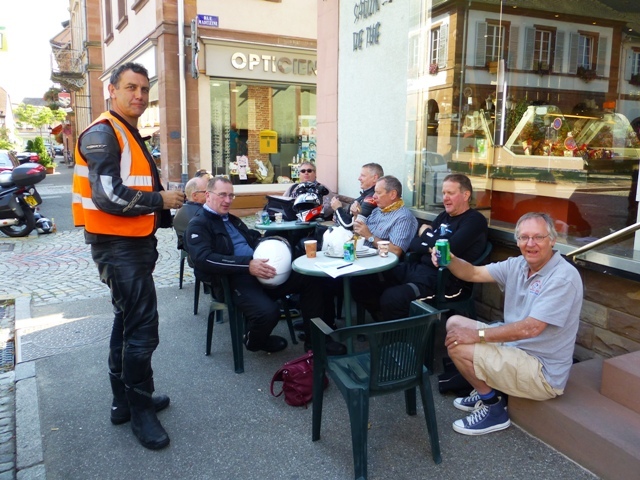 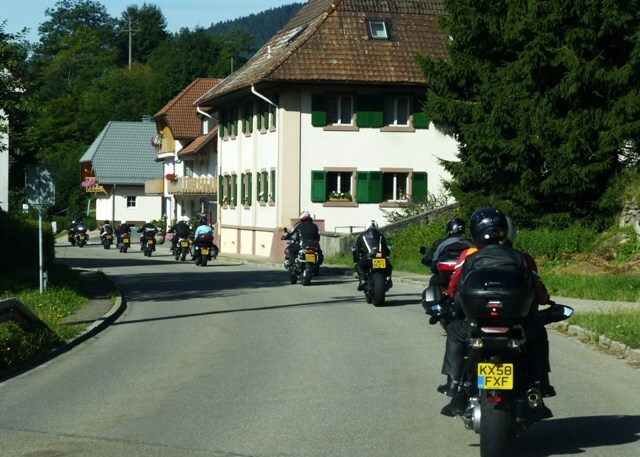 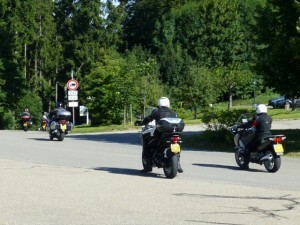 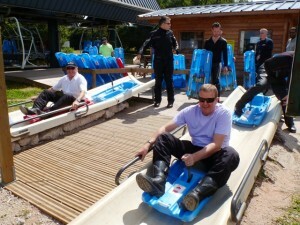 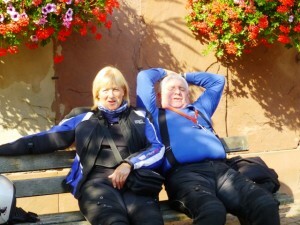 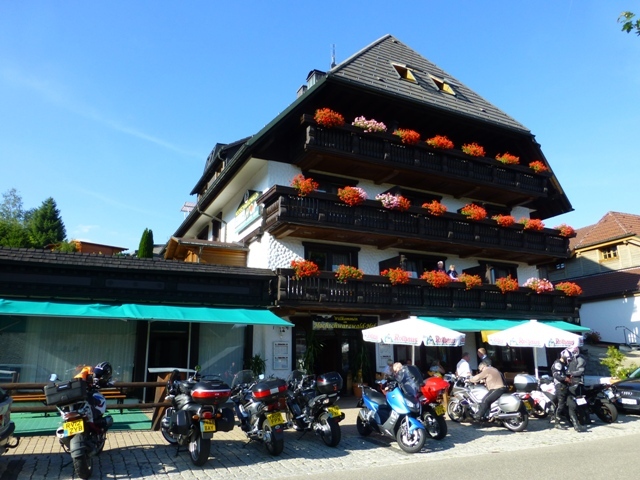 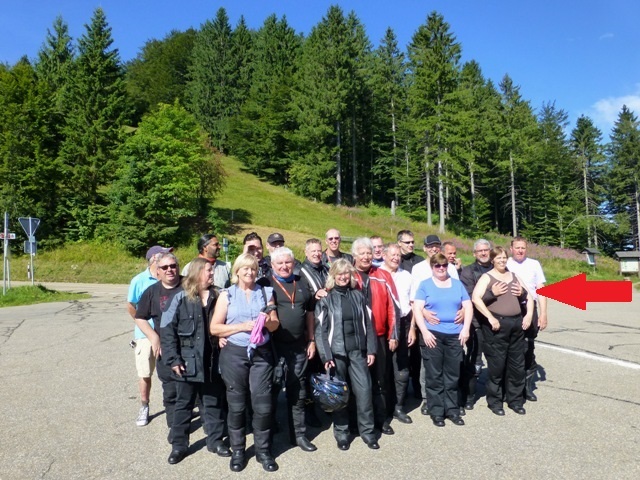 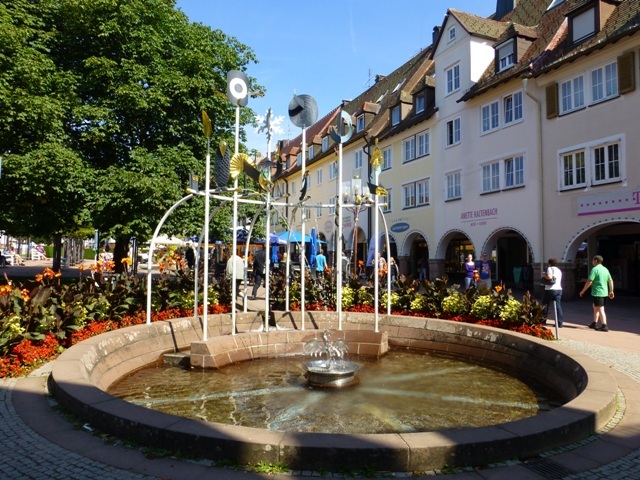 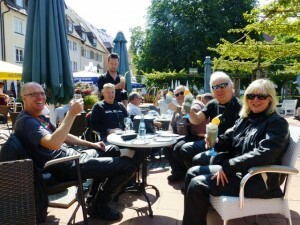 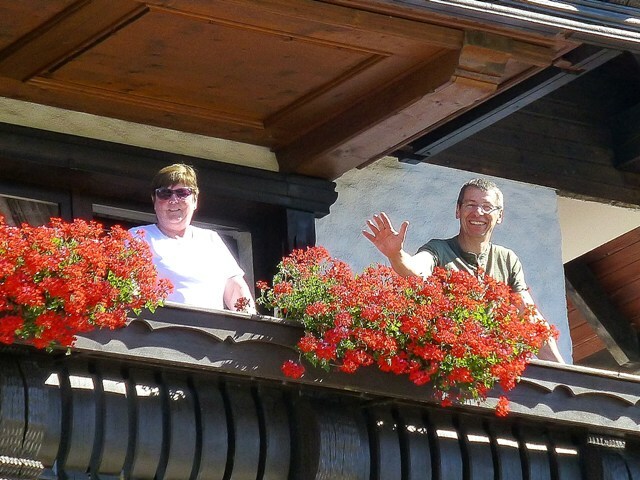 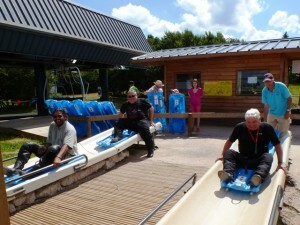 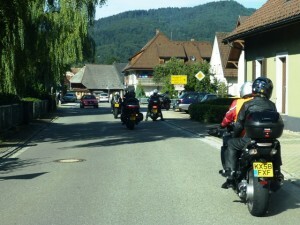 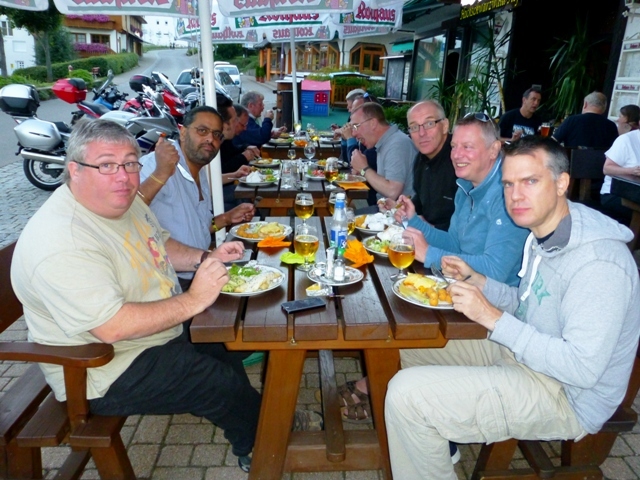 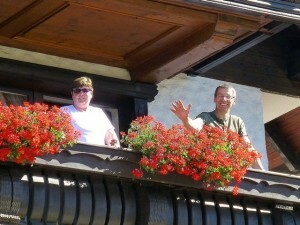 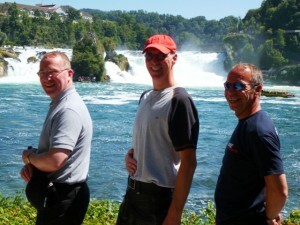 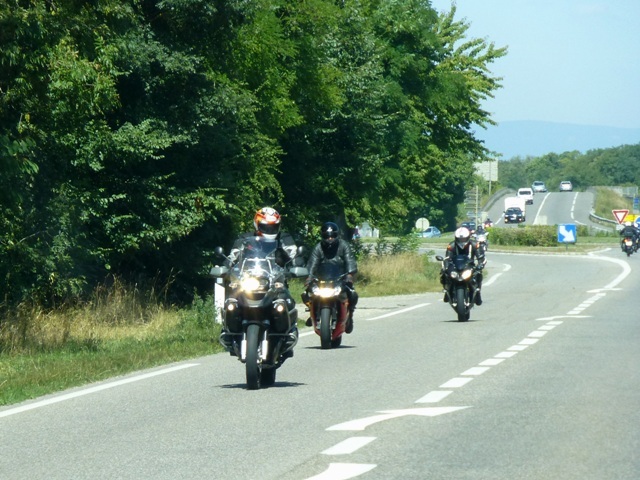 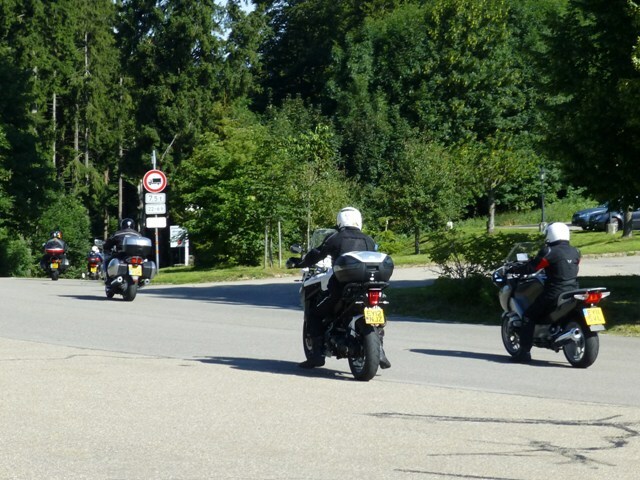 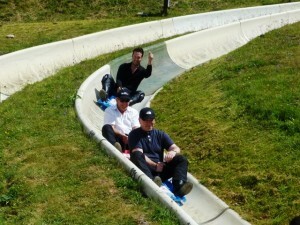 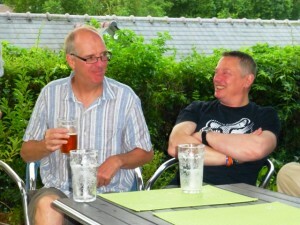 The group in the Black Forest – a fabulous trip with great weather, riding & company. 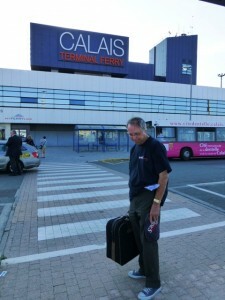 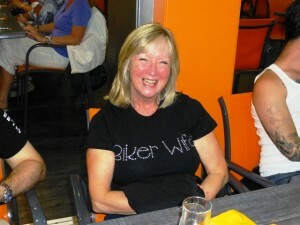 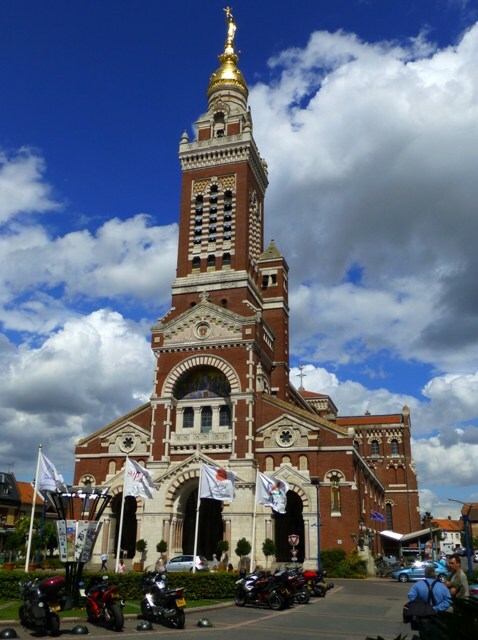 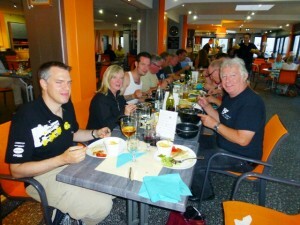 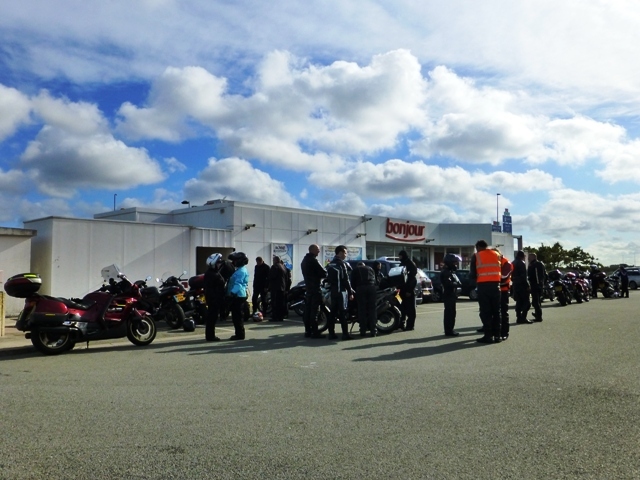 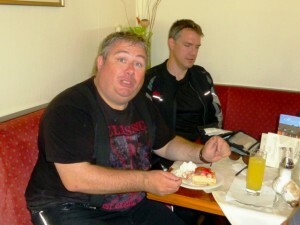 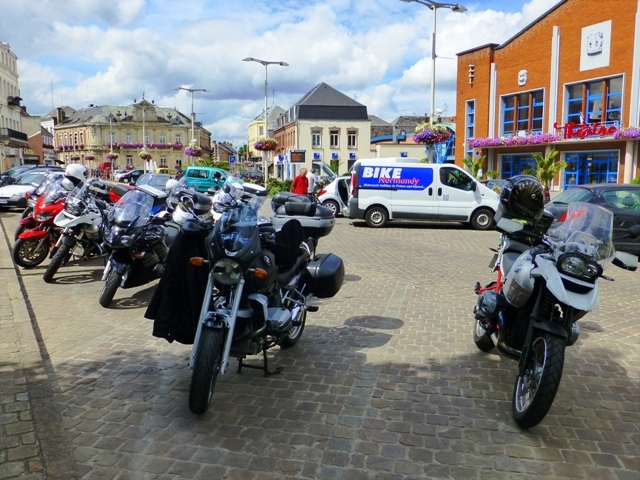 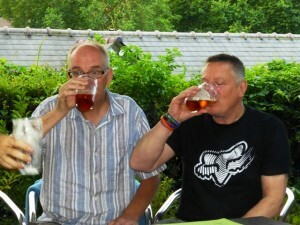 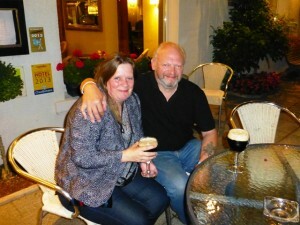 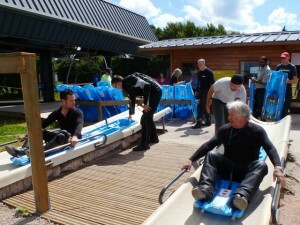 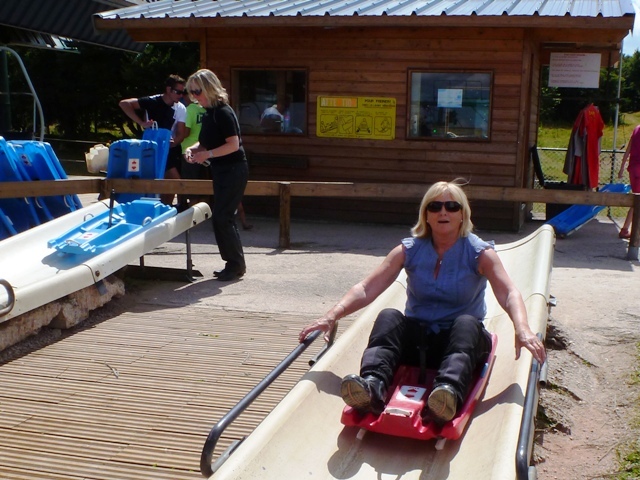 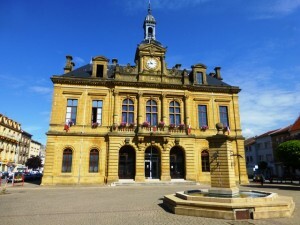 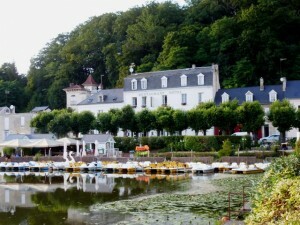 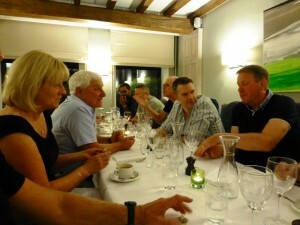 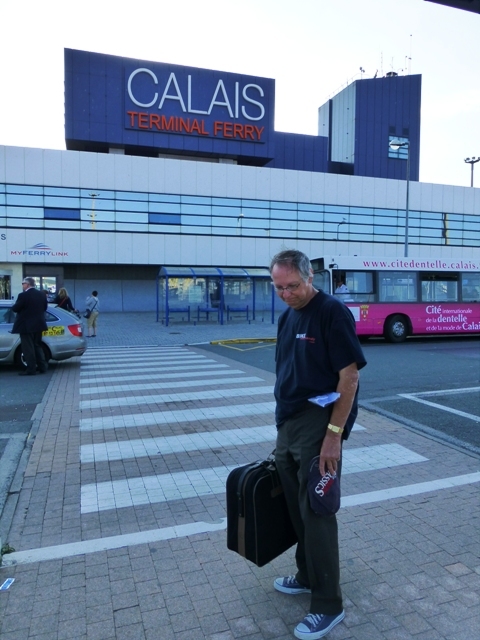 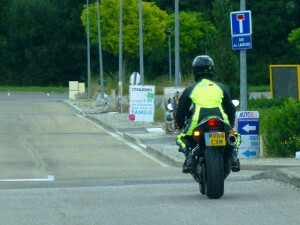 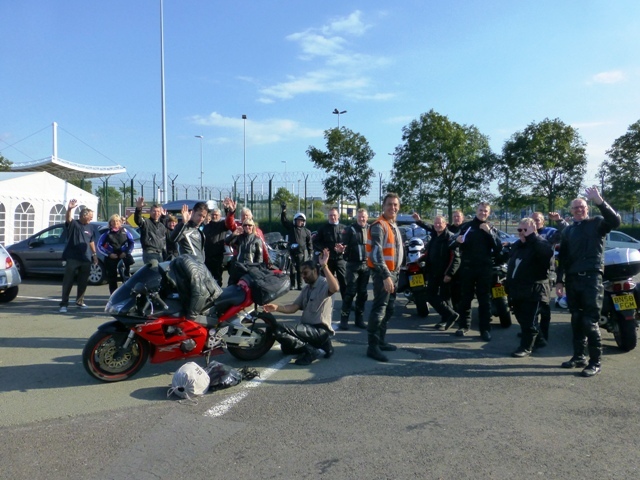 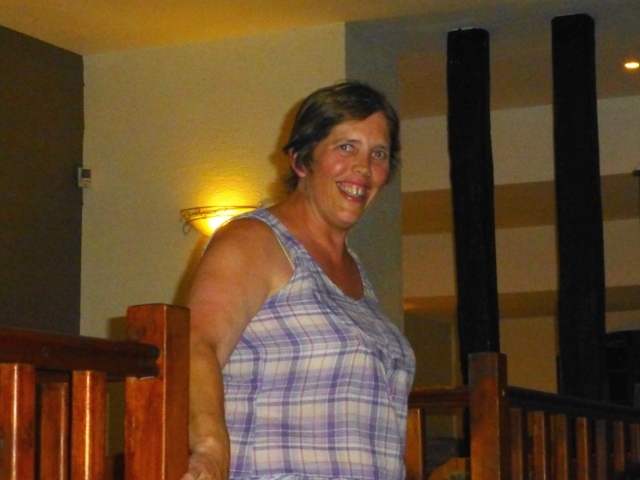 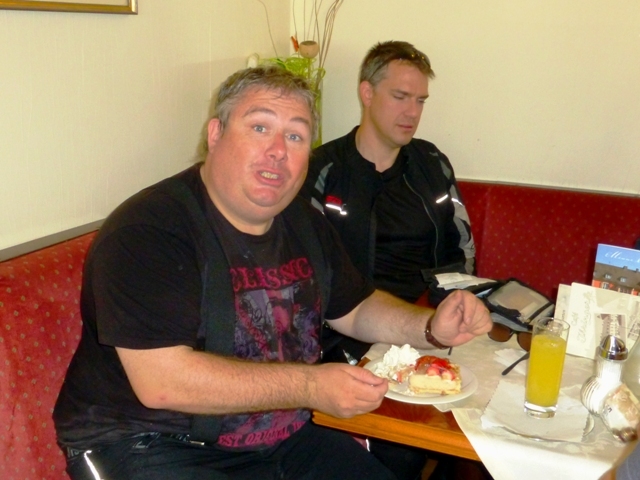 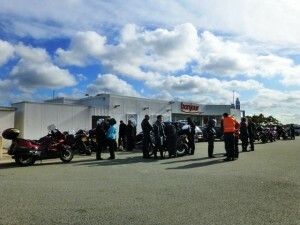 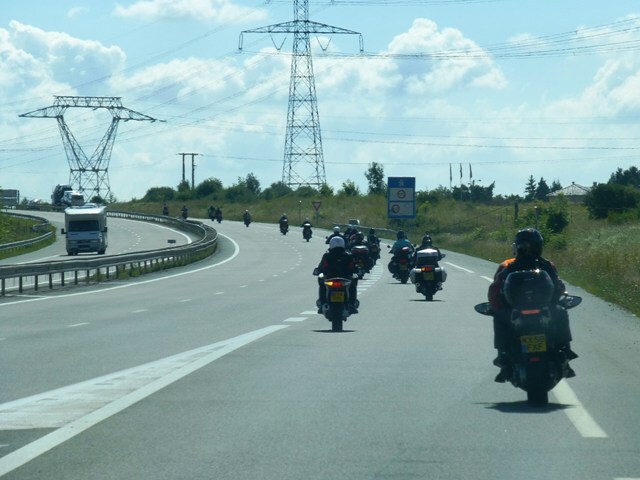 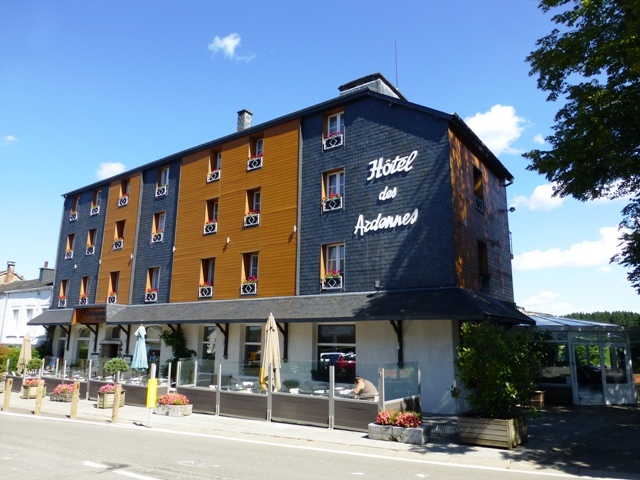 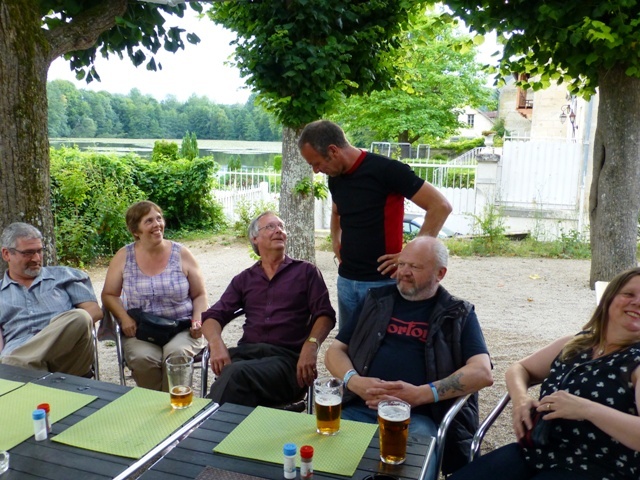 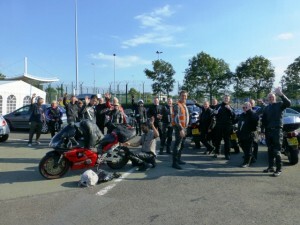 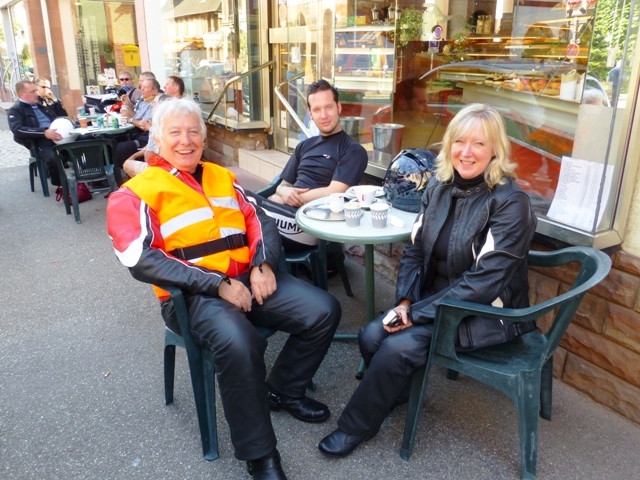 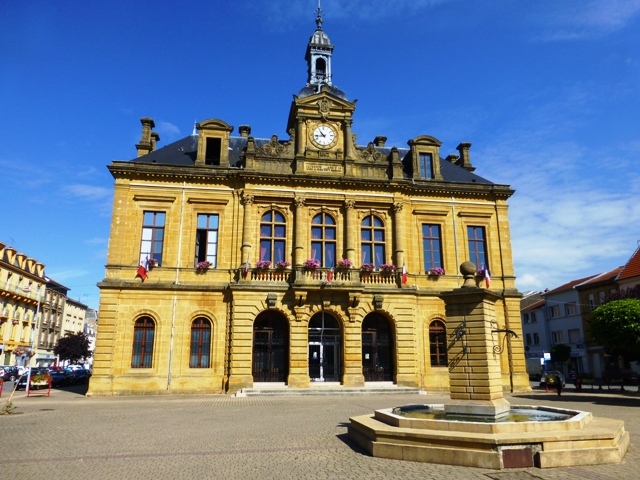 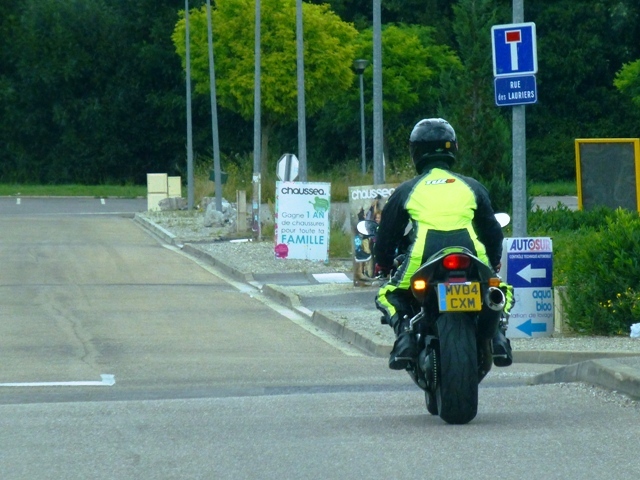 Most of the group arrive in Calais the night before…an apprehensive Jacqui…who soon becomes a real Biker Wife! This is how it all started…Thunderbird 1, 2, 3 or 4? 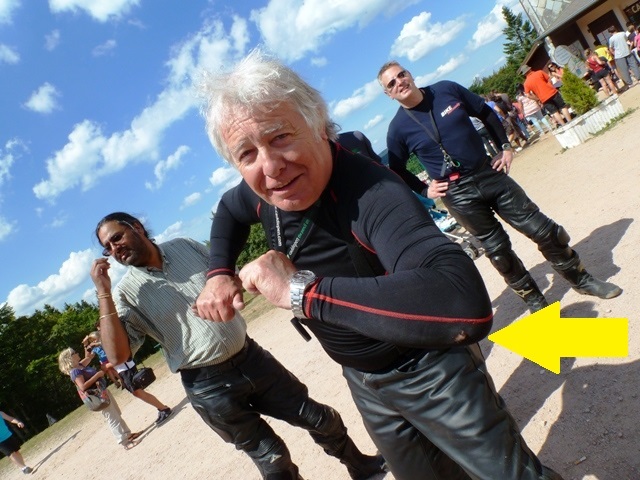 No – it has to be “Parker”, Lady Penelope’s chauffeur! 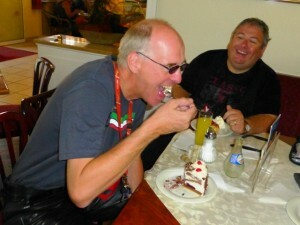 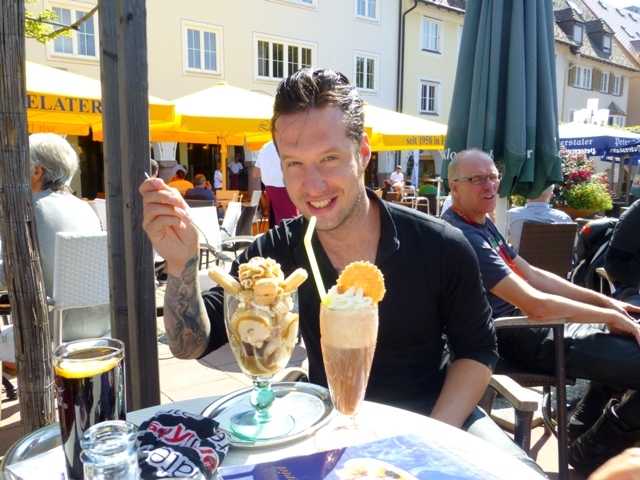 Iced coffees all round…Simon can’t resist a sundae as well! 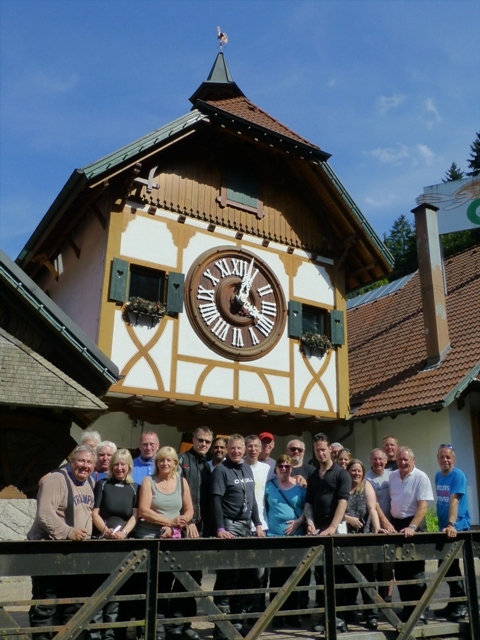 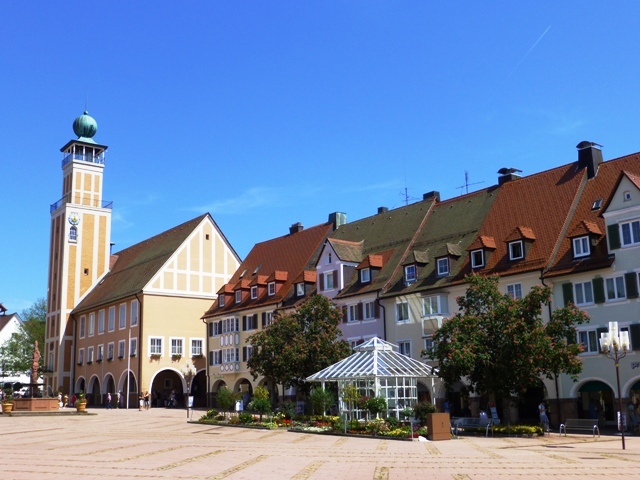 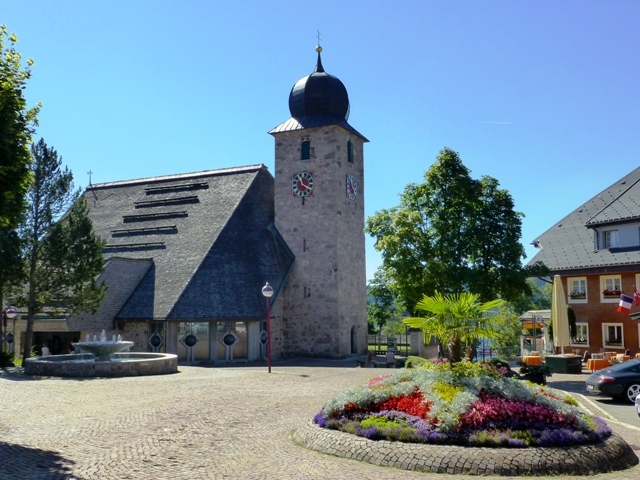 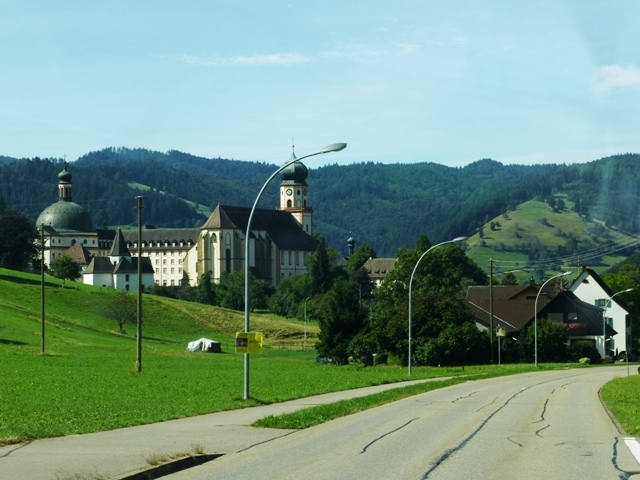 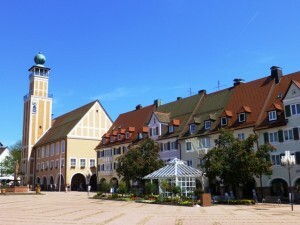 Our next stop, the largest cuckoo clock in the World! 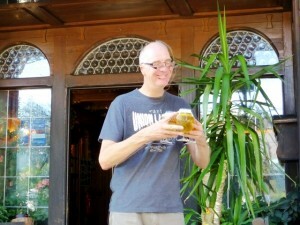 Drinks before dinner…Doug, Simon & Parker…Trigger arrives with the beers! 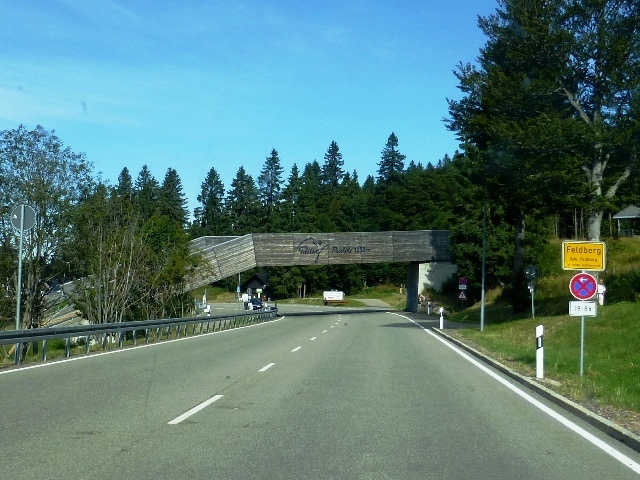 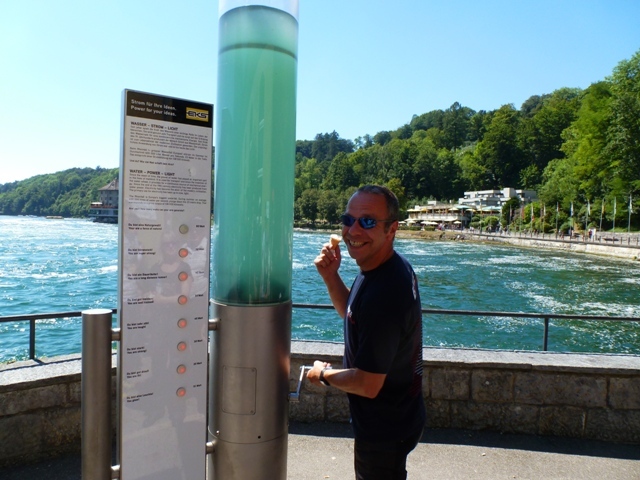 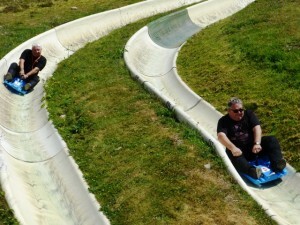 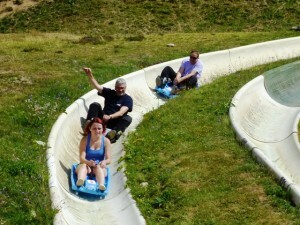 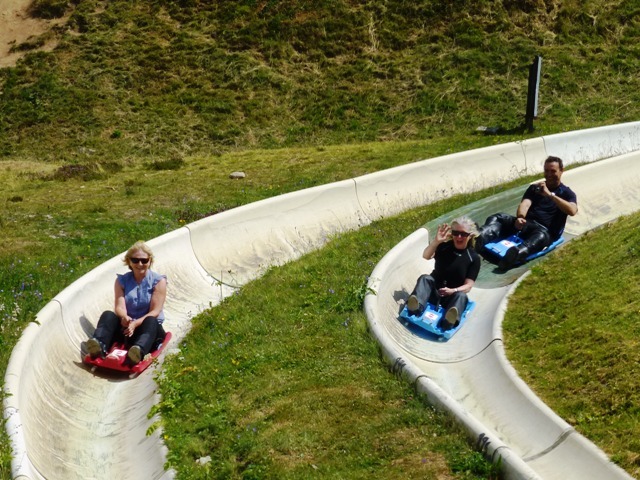 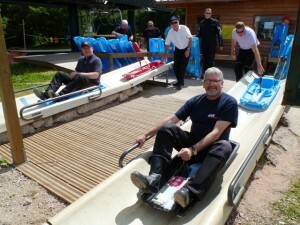 We head out of Germany passing underneath a ski-run! 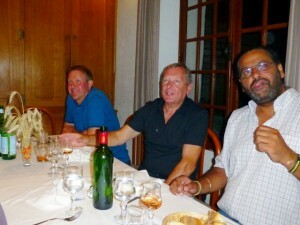 Note where Gordon’s hands are !!! Another picturesque coffee stop where we spot Doug’s next scooter! Our own Marco Marquez! 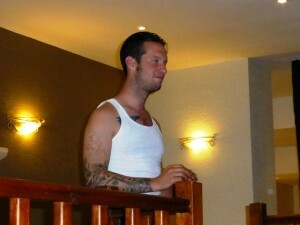 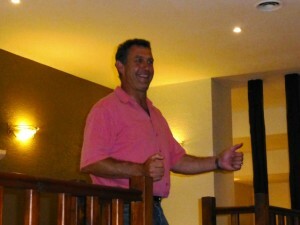 Geoff (with bodyguards in tow!) manages to get his elbow down!! 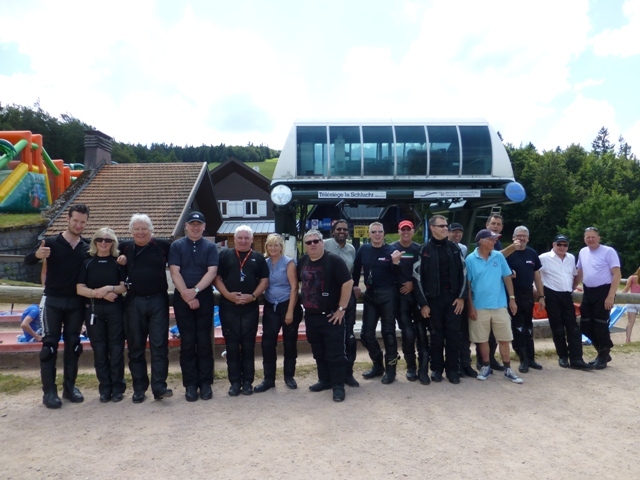 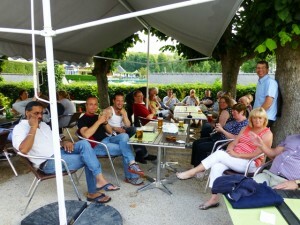 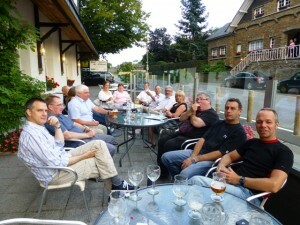 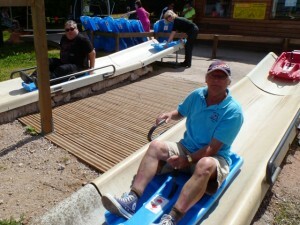 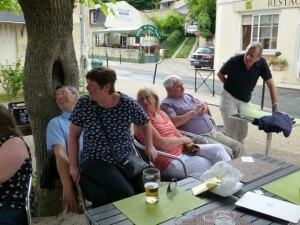 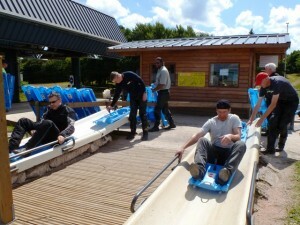 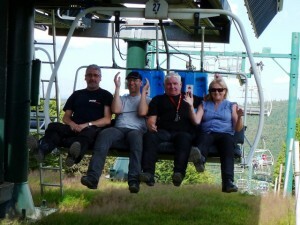 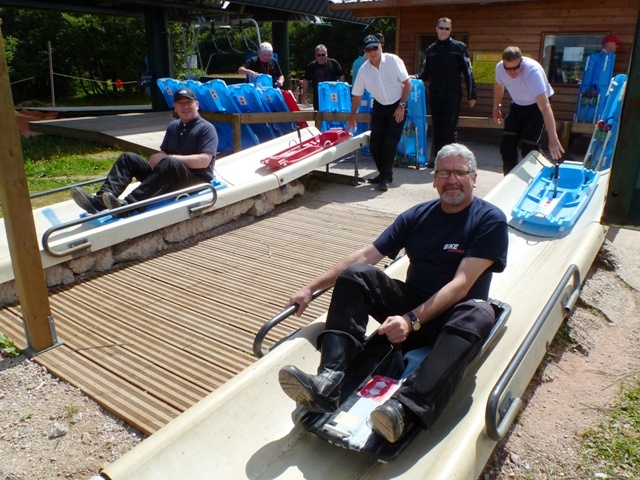 The group in the Vosges Mountains – sorry Ian, yet another group photo! At the fist (and only) drop of rain Surrey dons his 1980’s shell suit! 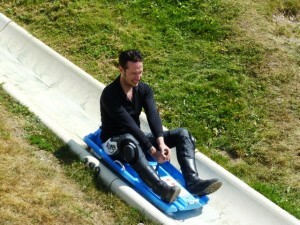 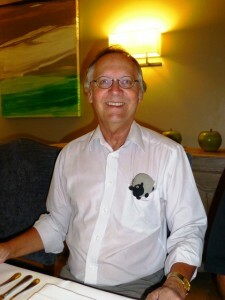 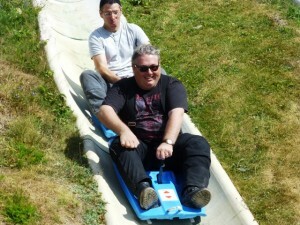 You can’t miss Simon either! 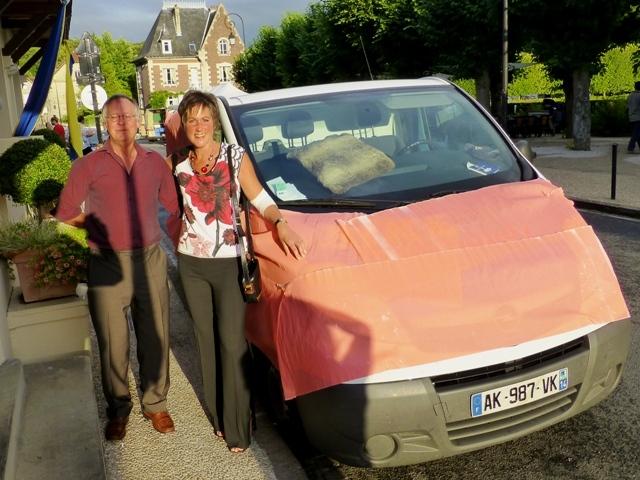 FAB 1 – A brilliant surprise! 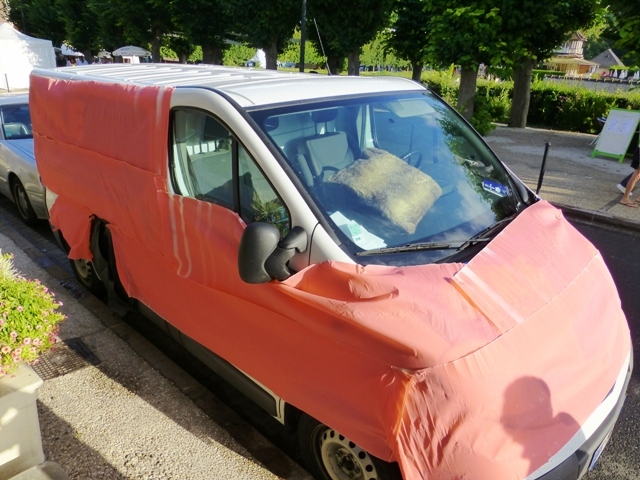 Parker turns the van into Lady Penelope’s Rolls Royce! 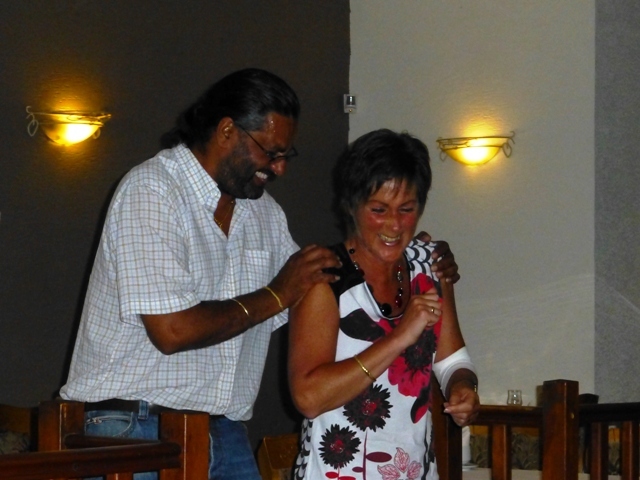 Even with Surrey’s support, Jen can’t help cracking up! 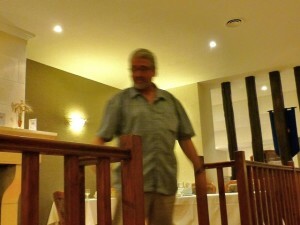 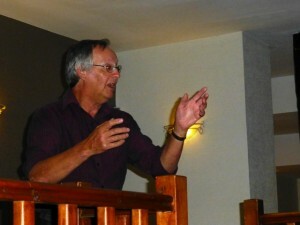 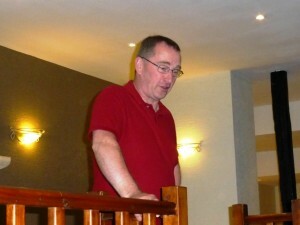 Sorry about the blurred photo Gordon! 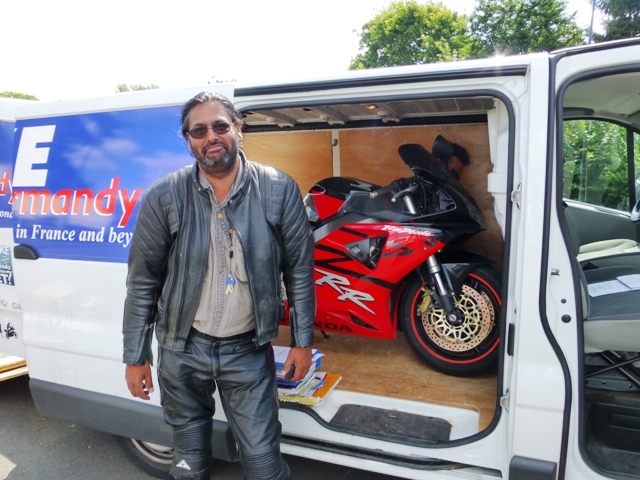 Surrey’s fireblade finally gives up the ghost & finishes the tour in the back of the van! 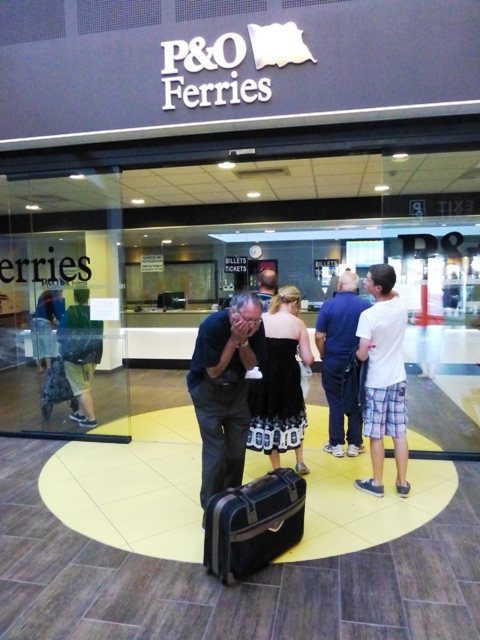 Parker is distraught at having to go home! 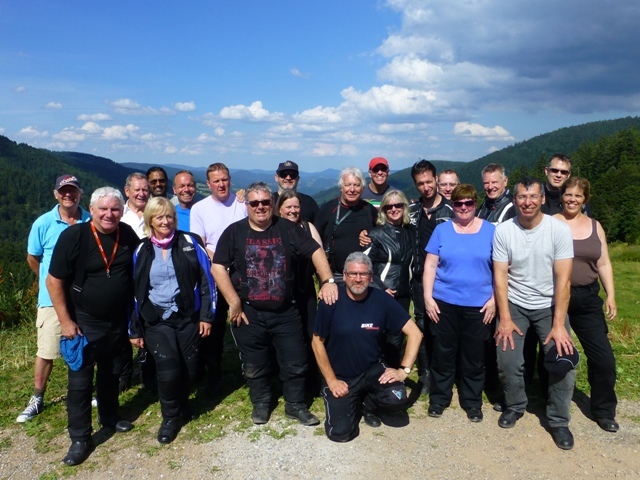 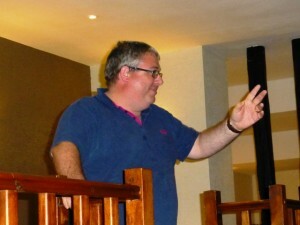 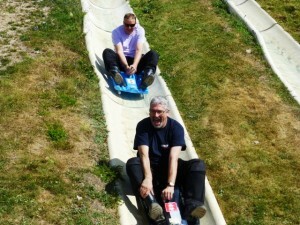 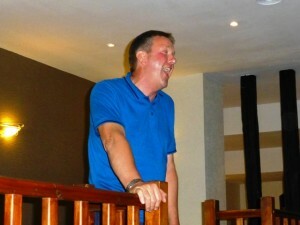 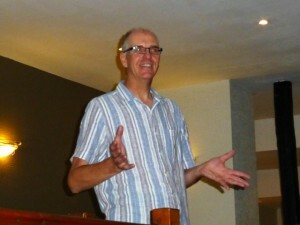 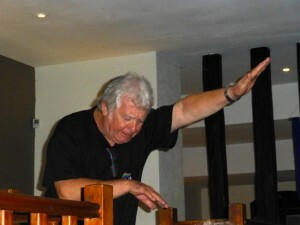 A FAB tour, this has to rate as one of our best thanks to a fantastic group of people who made it such fun. 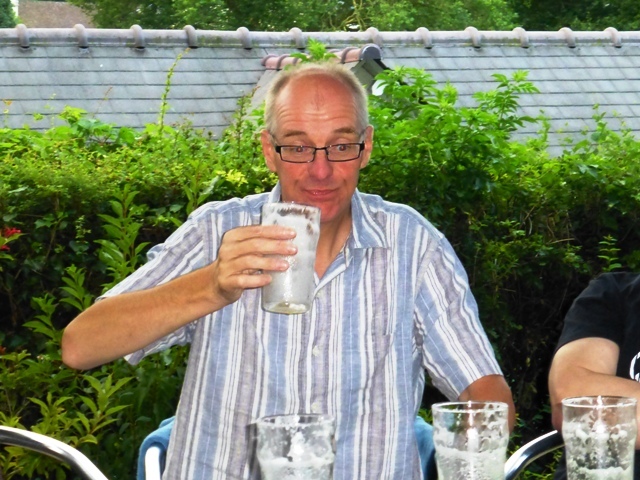 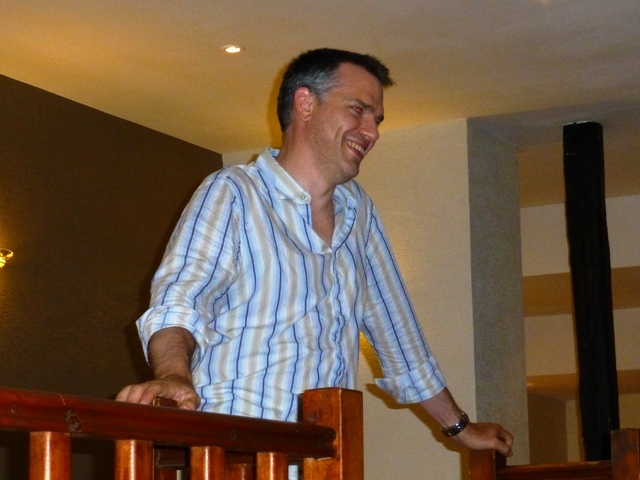 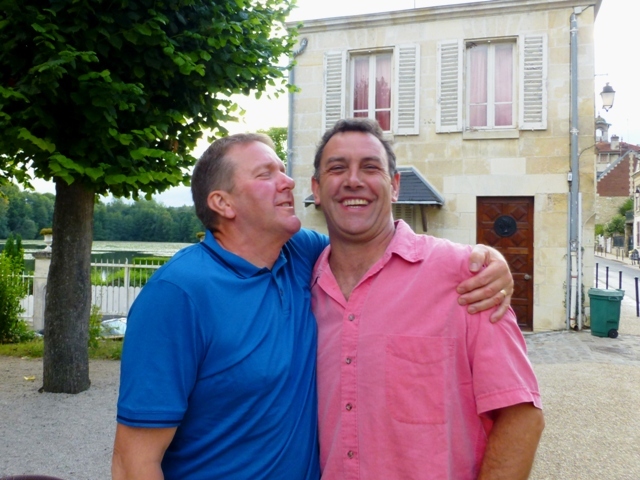 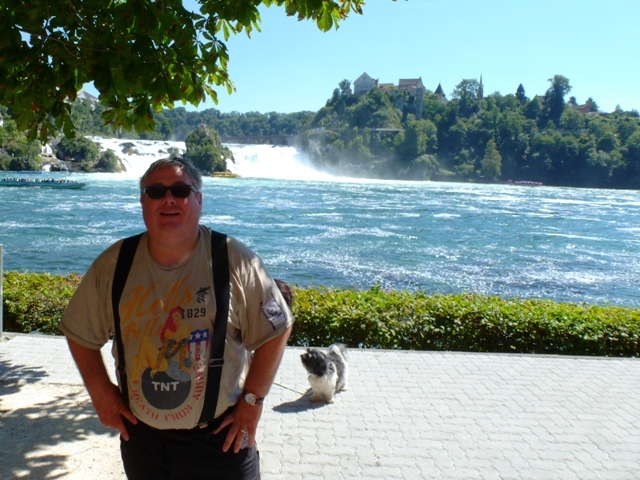 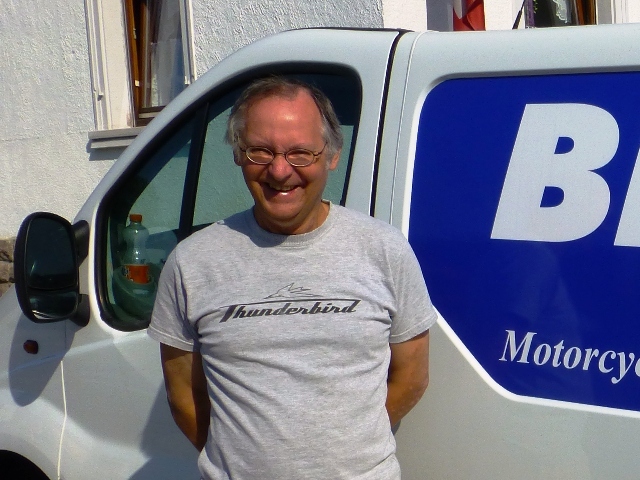 Special thanks to Paul Poulton – whom everyone now knows as “Parker” – who dropped everything with just one day’s notice to drive the luggage van and look after “Mi Lady” Jen. 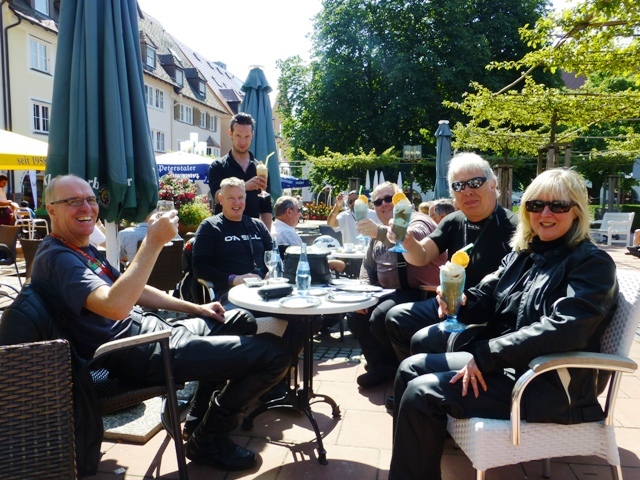 We look forward to seeing many of you again on future tours. 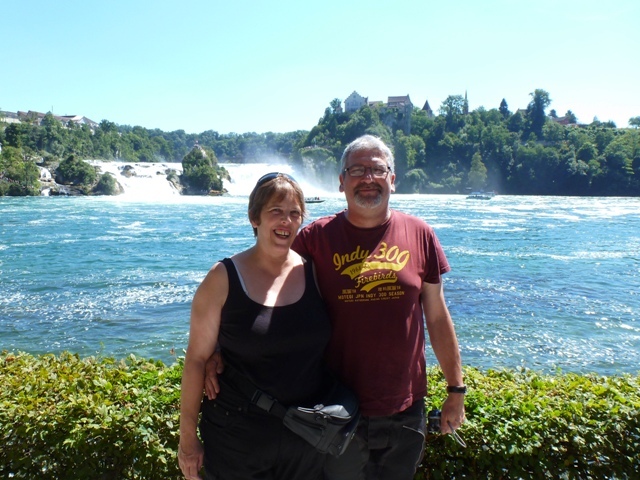 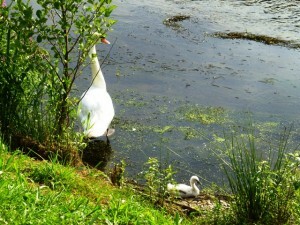 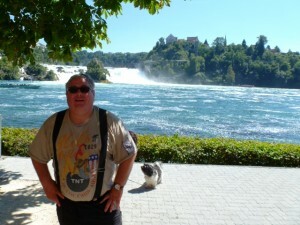 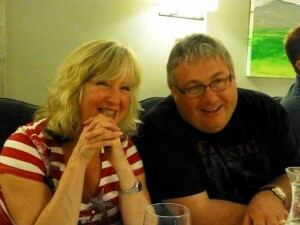 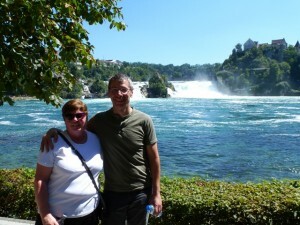 Regards to all, John & Jen.